OK, this is the last post about Helsinki, seriously. Well, until August, because I’m going back there for the 75th World Science Fiction Convention. But for now, this is it. 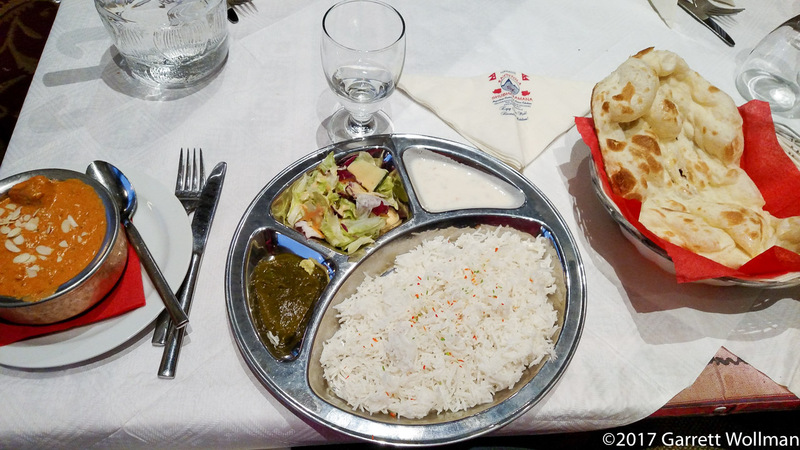 I have one more post from my day-trip to Turku, and then it’s back to food for a while. 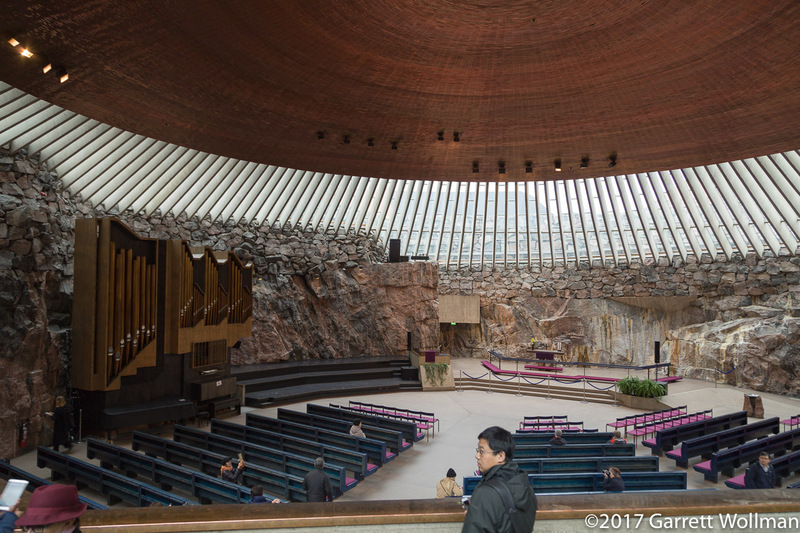 I conclude with a mega-gallery (more than 100 photos) of architecture (and a little bit of mass media) in Helsinki. Our tour starts with the media village just south of Ilmala station on the coastal commuter rail line, home to the state broadcaster Yle and commercial MTV. 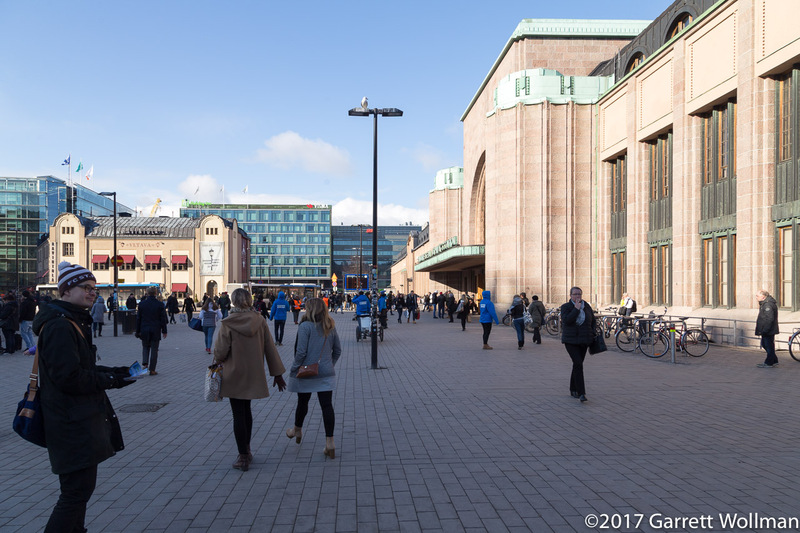 I then take you back to Helsinki Central railway station, and have a walk around Railway Square and into the nearby shopping neighborhoods. Later on in my trip, after the World Figure Skating Championships had wound down, I went out to find the former offices of the exchange agency that first brought me to Finland in 1988, and finished up on the morning of my last day in Finland with some of the major tourist sites near the Parliament buildings. 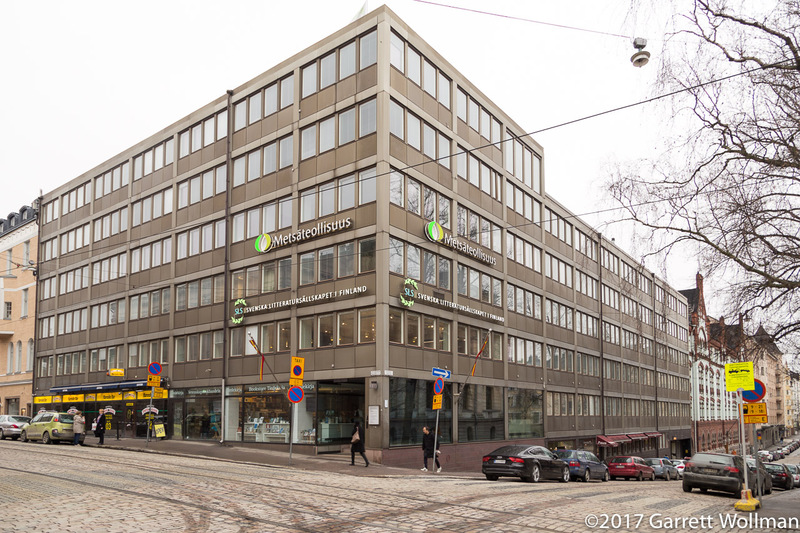 This building on Veturitie (its postal address is apparently Radiokatu 5A) is currently the corporate headquarters of Yle, Finland’s national broadcaster. 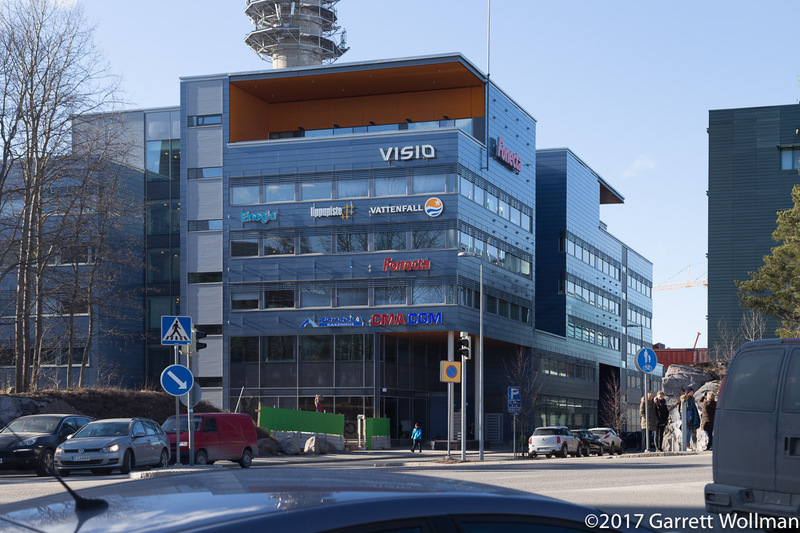 Called iso Paja, it was recently sold to the national railway operator VR Group to be its head office, and Yle head offices will be relocated to nearby Mediatalo. 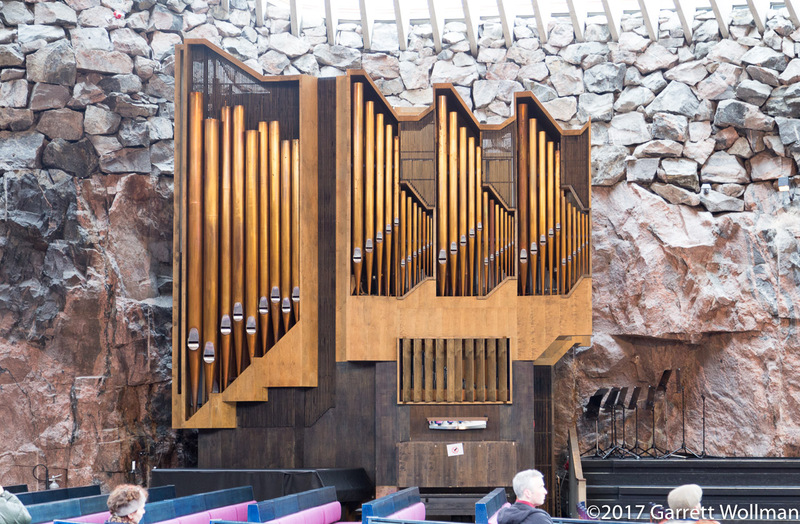 The building was designed by Ilmo Valjakka and erected in 1993. All of the streets in this district have names relating to broadcast media: in addition to Radiokatu, there’s Televisiokatu, Uutiskatu (“News Street”), and Kuuluutajankatu (“Street of the Listener”), among others. An apparently unnamed road runs parallel to Veturitie and the railroad tracks. 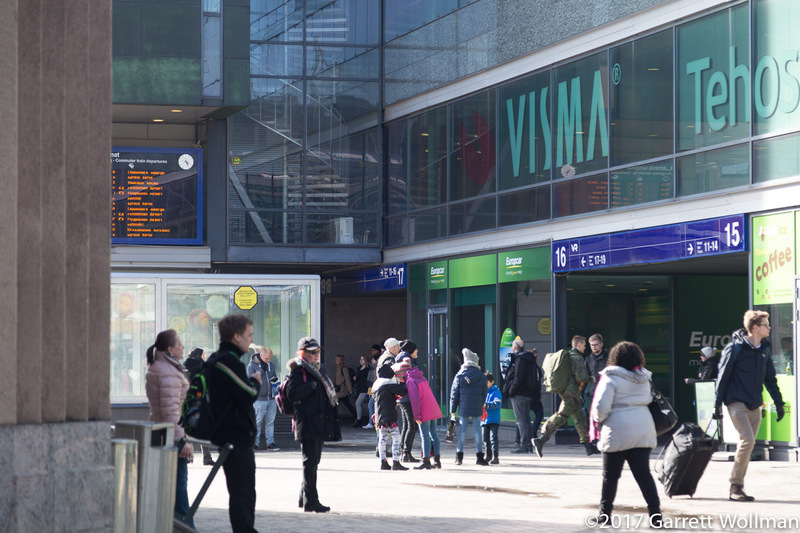 Where it meets Veturitie, this sign directs cyclists and pedestrians to low-traffic routes to nearby train stations, including Pasila and Ilmala stations. 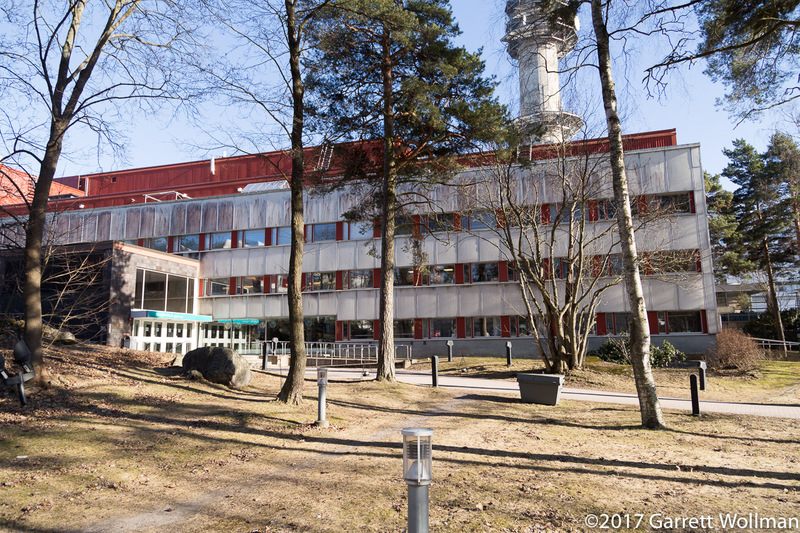 Just north of the Yle campus, at Televisiokatu 4, is a commercial office building whose tenants include the Swedish power company Vattenfall, the ticket agency Lippupiste, and telephone directory publisher Fonecta. Visio is apparently a restaurant, not the TV/computer monitor brand. 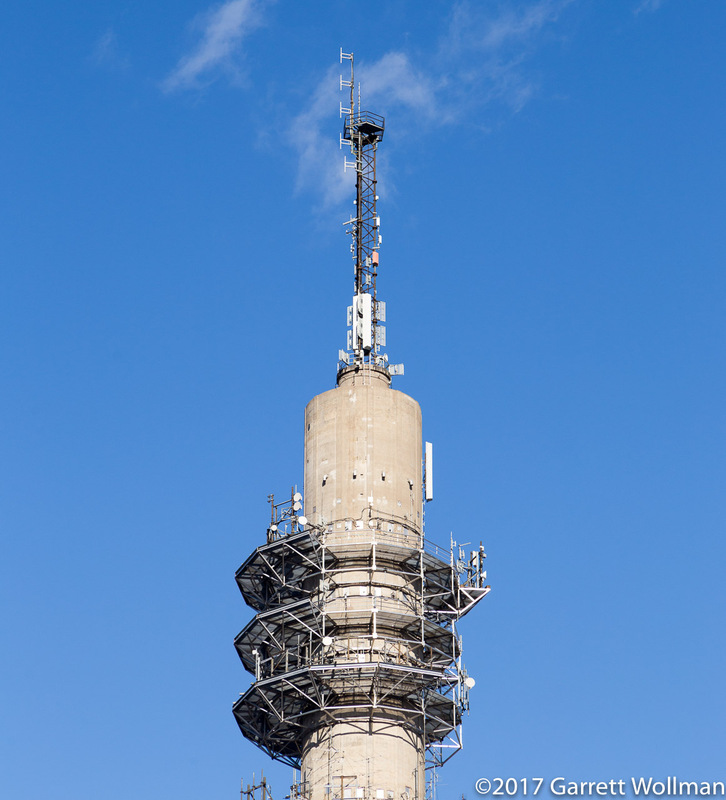 According to Wikipedia, this modest inter-city microwave relay tower on Uutiskatu is the tallest free-standing structure in Greater Helsinki, at 146 meters in height. It was completed in 1983. In Finnish, it’s called Pasilan linkkitorni, “Relay tower of Pasila”. MTV Oy (originally Mainostelevisio, “Commercial television”) was Finland’s first commercial TV broadcaster. 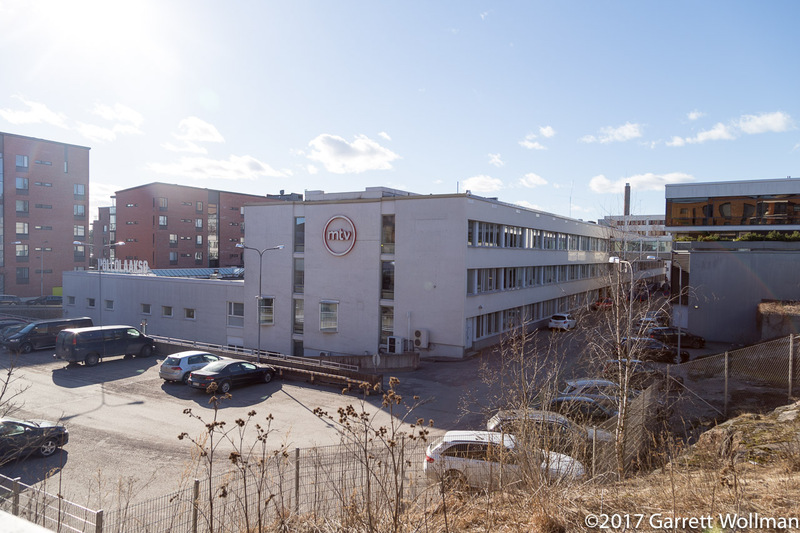 Its main studios are located immediately west of the Yle campus, just south of Ilmala station. 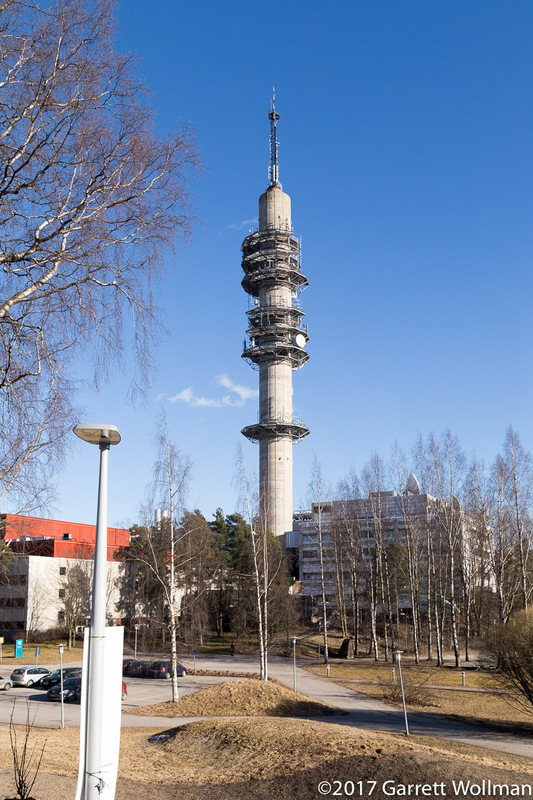 MTV operates “channel 3”; before being granted a channel of its own, MTV leased time on Yle’s TV1 and TV2 transmitters. 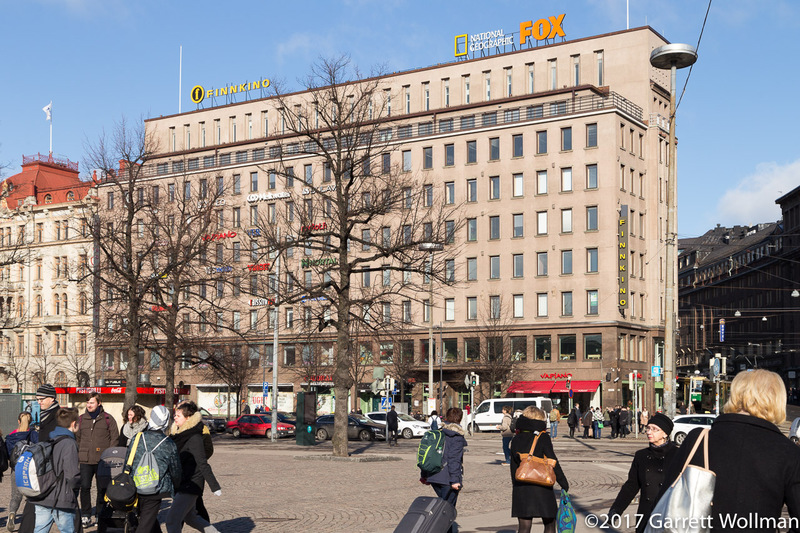 In more recent years it’s been joined by another commercial channel, Nelonen (“4”, as in the digit), and the Swedish-language “Yle Fem” (“five”), and most recently, a commercial digital channel currently owned by and branded as Fox. At the end of Kuuluutajankatu, this building houses MTV’s news department. 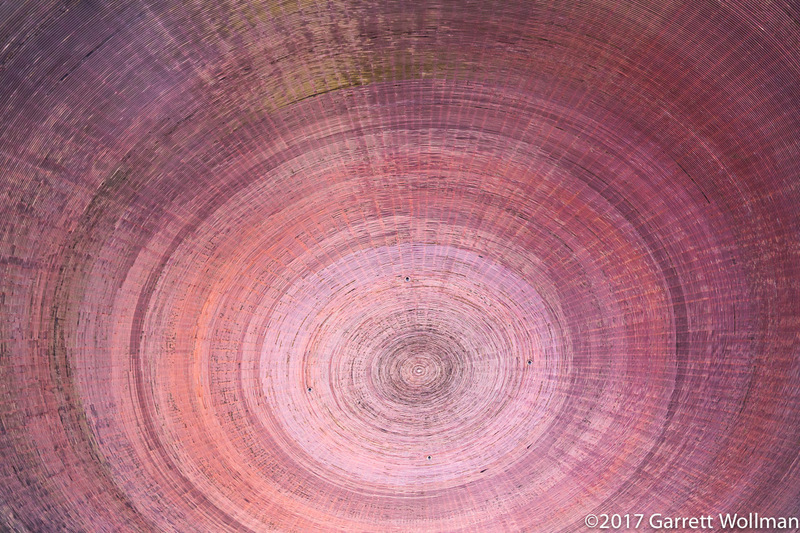 A close-up of the top of Pasilan linkkitorni, showing the antennas. 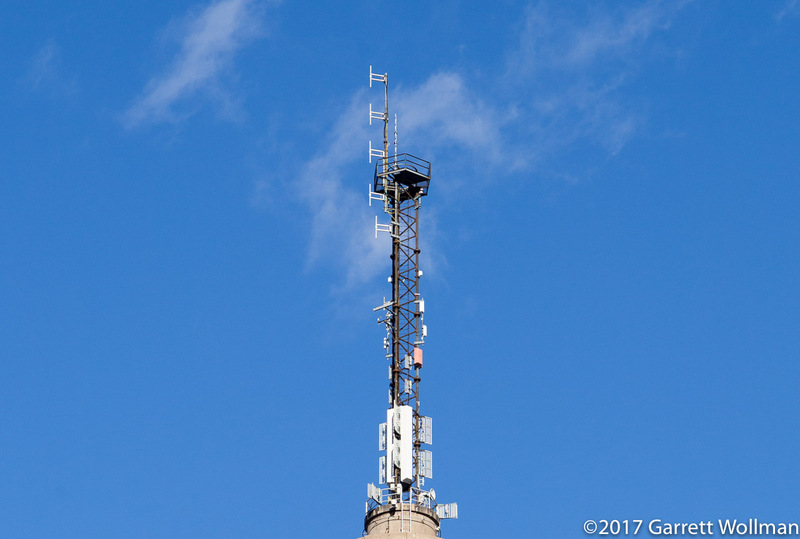 An even closer close-up shows what I believe to be two FM antennas at the very top of the tower, and lower down what I suspect to be either DAB or DTT antennas. Given the arrangement of the antenna elements on the mast, I suspect a four-bay FM antenna on the pole, with a single-bay backup on the mast proper. In front of the Yle Mediatalo/Radiotalo complex is a parking lot, I assume for visitors given how few vehicles were parked there on a weekday afternoon. 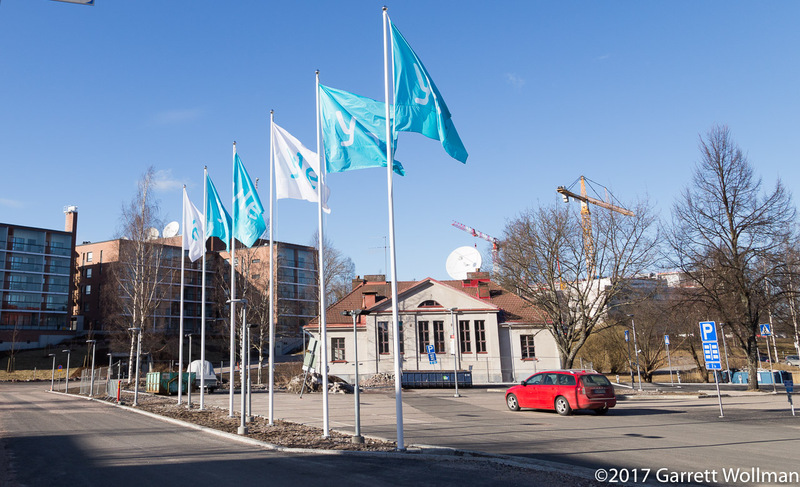 The row of flags displays the Yle logotype and colors. Mediatalo, “Media House”, is the first building we come to on the Yle campus. 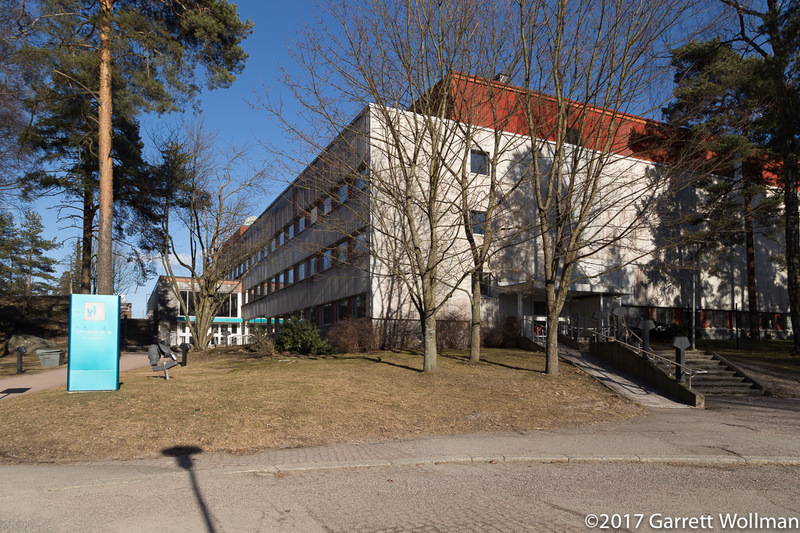 The street address of this part of the complex is Uutiskatu 5. 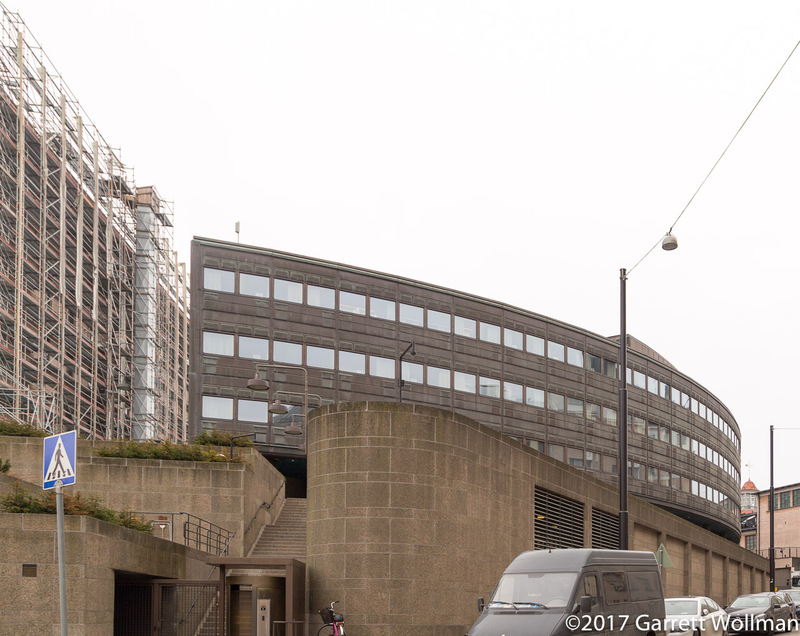 The building was originally called Radiotalo, “Radio House”, and it has been expanded multiple times since its original construction in the 1960s, most recently in 1979 when the high-rise section at front was added, designed by Kurt Simberg. Parts of the building are being renovated for a new corporate headquarters, replacing Iso Paja (seen earlier), which has been sold. Note the bike racks by the entrance. 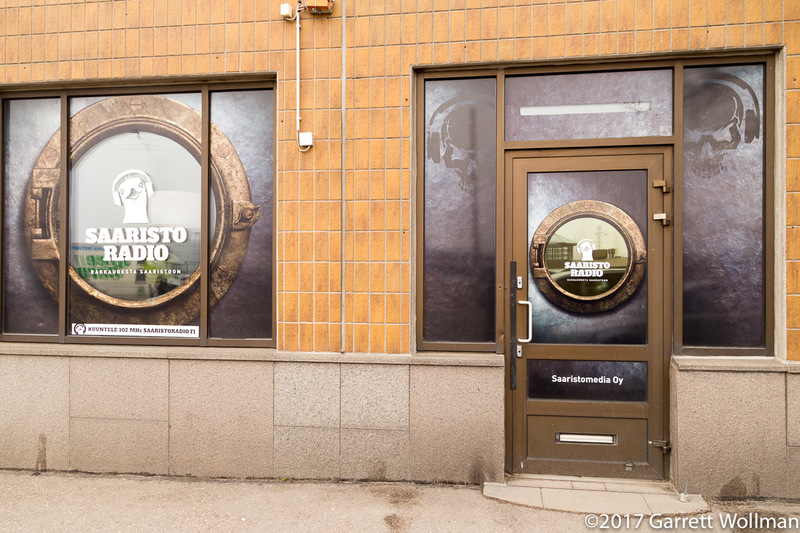 The sign at left identifies the former name of the building, Radiotalo. Another building in the Yle campus is called Studiotalo, “Studio House”, but I can’t find any information about what’s inside (other than, well, studios of some sort). 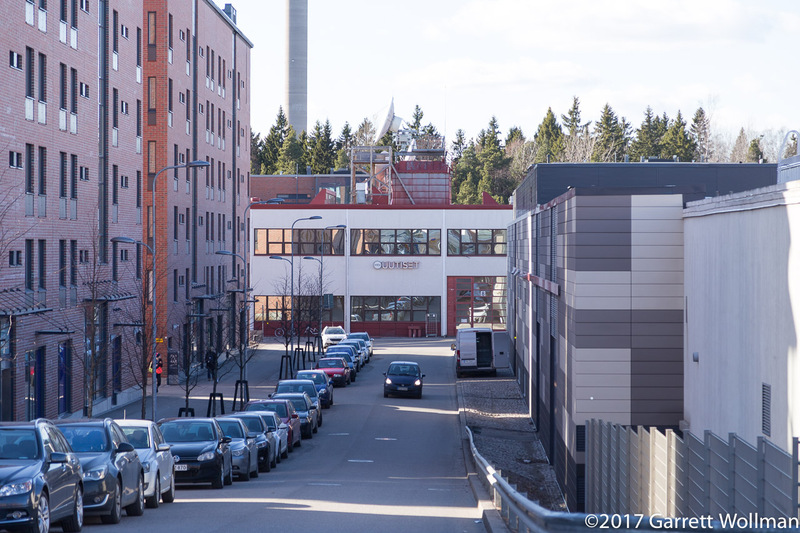 It’s not even clear if it has its own street address — Google Maps gives the same Uutiskatu 5 address as all the other buildings. Here’s a view of Studiotalo from the west, with the concrete base of Pasilan linkkitorni rising above it in the background. I’m standing on a driveway down which an Yle remote production truck — still wrapped in an advertisement for coverage of the 2014 Winter Olympics in Sochi. 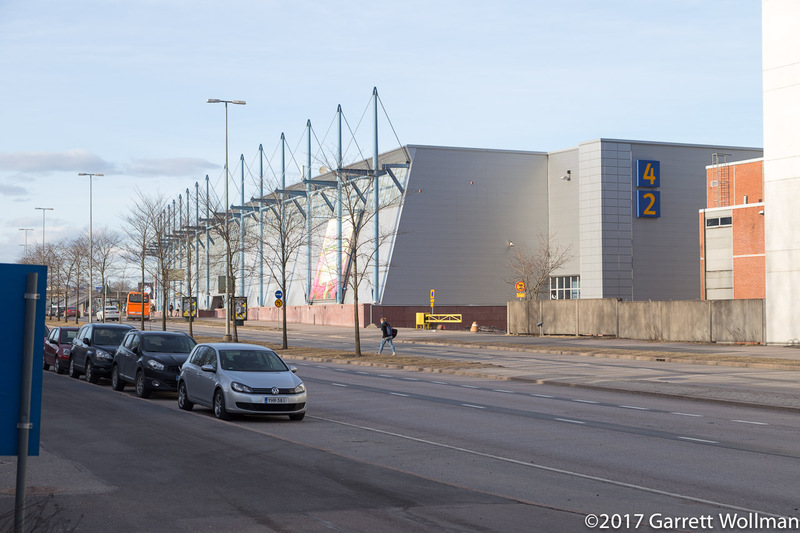 I attended the World Figure Skating Championships, which were held in Hartwall Arena — named after a brand of beer — during the last week of March. It’s a fairly ordinary specimen of its type; the only really interesting feature is the way it was built in the wye junction of the two major railway lines heading out of Helsinki. Parking for the arena is in a sub-surface structure below the pavement seen here, looking out onto the railroad cut. 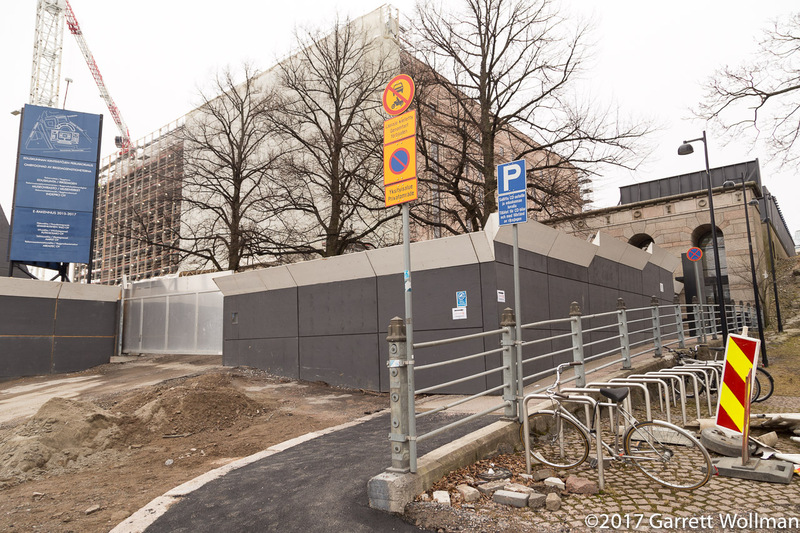 A large brownfields/air-rights development at Pasila station, called “Tripla”, is currently under construction. I thought these modular temporary construction offices were interesting, a far cry from the usual “trailers” that we’re used to seeing. 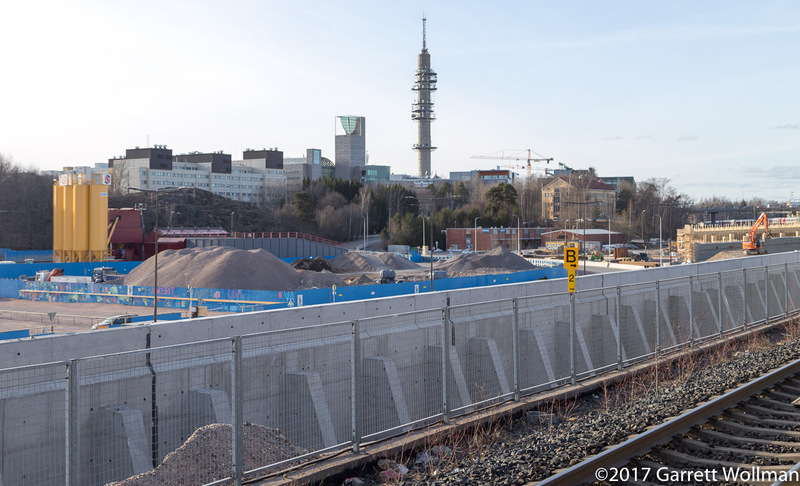 Looking northwest from Pasila station, a view of the Tripla construction site and, in the distance, Pasilan linkkitorni and the Iso Paja office building. 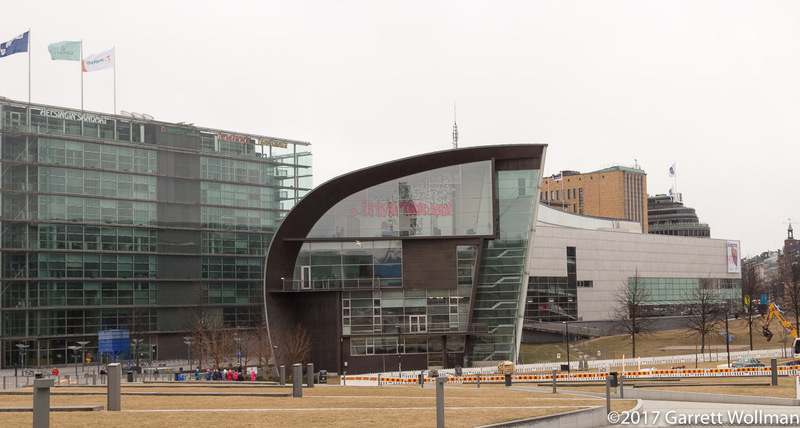 The Helsinki convention hall, Messukeskus, is located on Ratapihantie just northeast of Pasila station. The 75th World Science Fiction Convention will be held here in August, so I’ll be able to see more of it at that time. 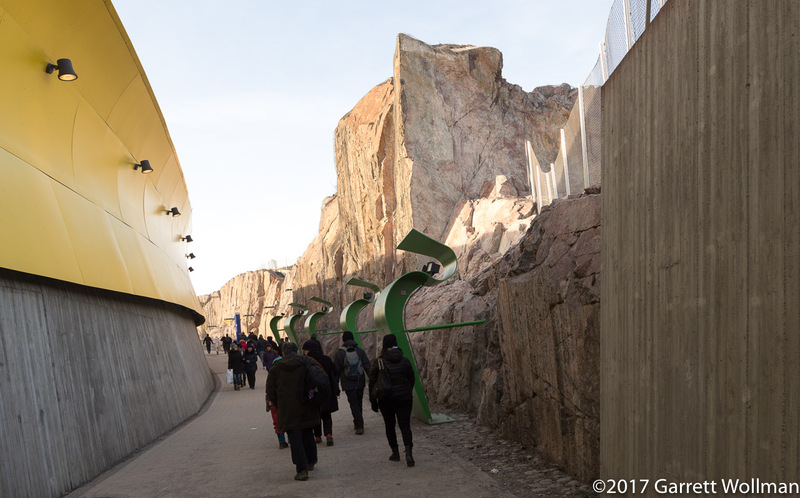 I thought the green metal structures and rock cut along the walkway from Pasila station to Hartwall Arena were interesting. There was also some sort of automated audio system making bird calls here as well, I assume to discourage birds from nesting where they might interact with arenagoers. At the head of the westernmost tracks of Helsinki Central Railway Station, a tall office building rises on air rights over the station walkways. The tracks stub-end without passing under any of the building, but passengers to tracks 15 through 19 walk under the building to their platform. A Europcar rental office occupies the ground floor (the cars are parked in a nearby surface lot). Note the outdoor train departure display at upper left. 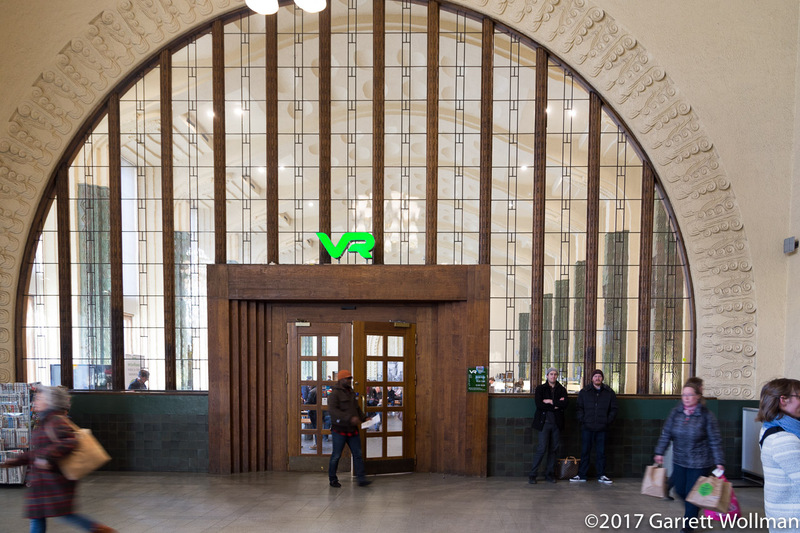 On the opposite side of the entry hall from the VR ticket office is (sigh) a Burger King. Escalators from the entry hall lead down to the concourse level, where there are shops, an HSL (Helsinki Regional Transit Authority) customer-service office, and access to the Rautatientori (“Railway Square”) metro stop. 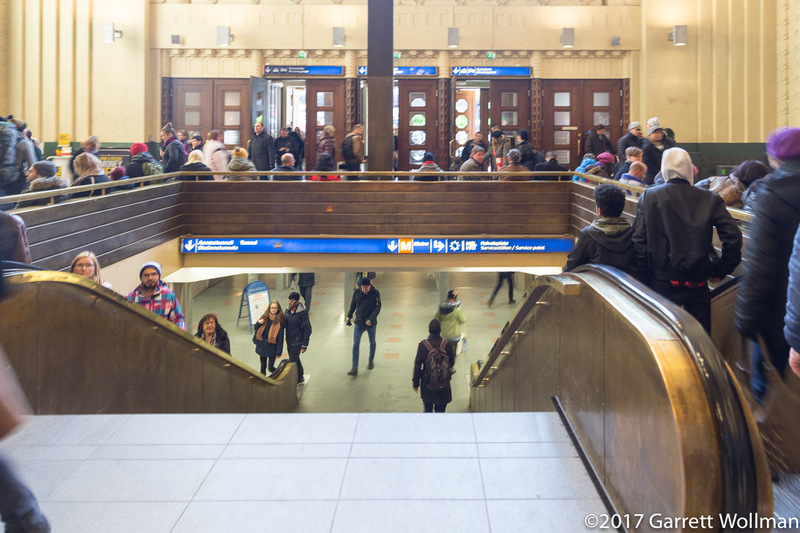 The concourse also connects via stairs to the tram stop in Kaivokatu and to nearby shopping and office buildings. Now looking from the front doors of the train station towards the main hall and the trainshed. 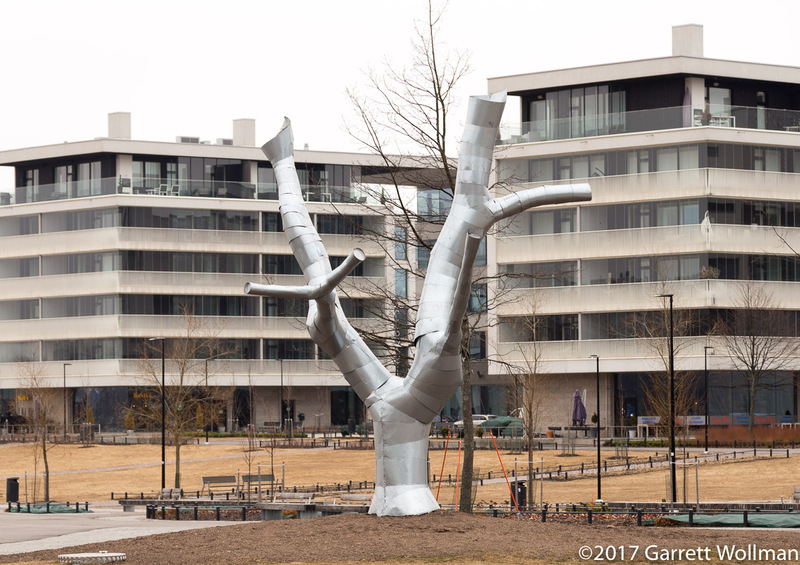 In addition to these spaces, there is also a shopping arcade on the west (left) side and additional offices and restaurants on the east side. 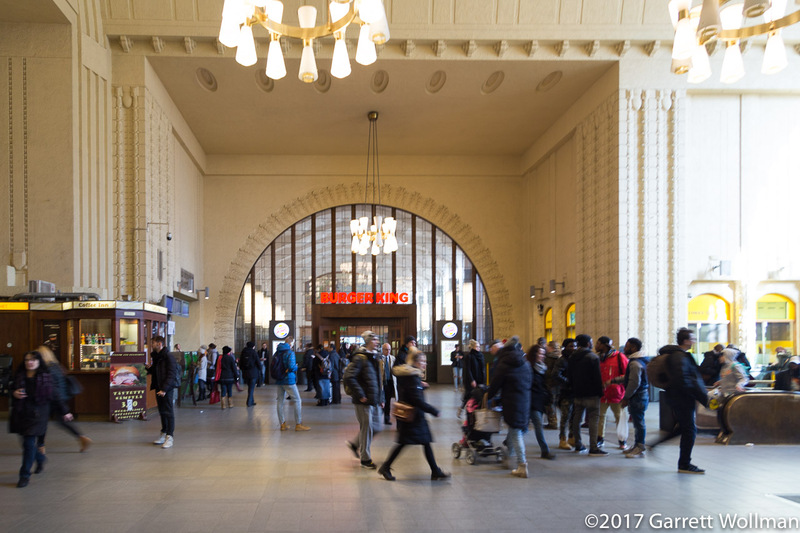 Helsingin päärautatieasema (Helsinki Central Railway Station) was built in 1919, just two years after Finnish independence, and designed by noted Finnish architect Eliel Saarinen. The station fronts on Kaivokatu, where a busy tram stop interchanges traffic with the Metro below; Railway Square is located on the east (right) side of the building. Local and express buses serve platforms on both sides of the station. 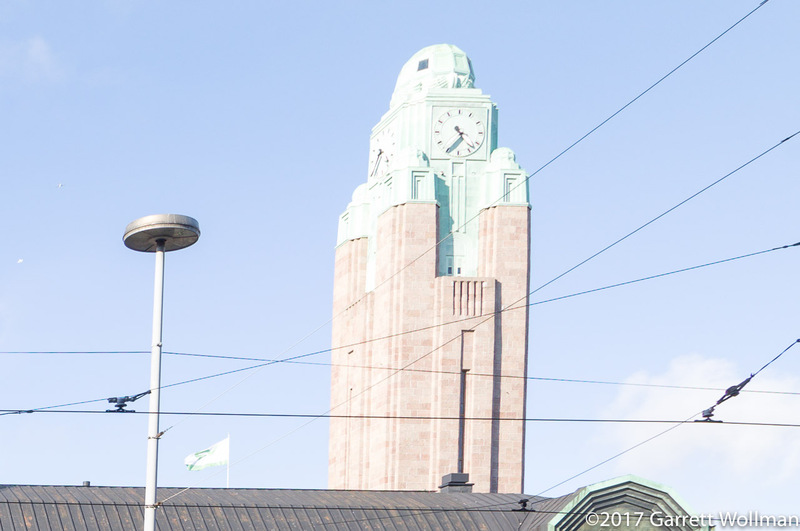 Here’s a close-up of the clock tower, seen past the trolley wire hanging over Kaivokatu. 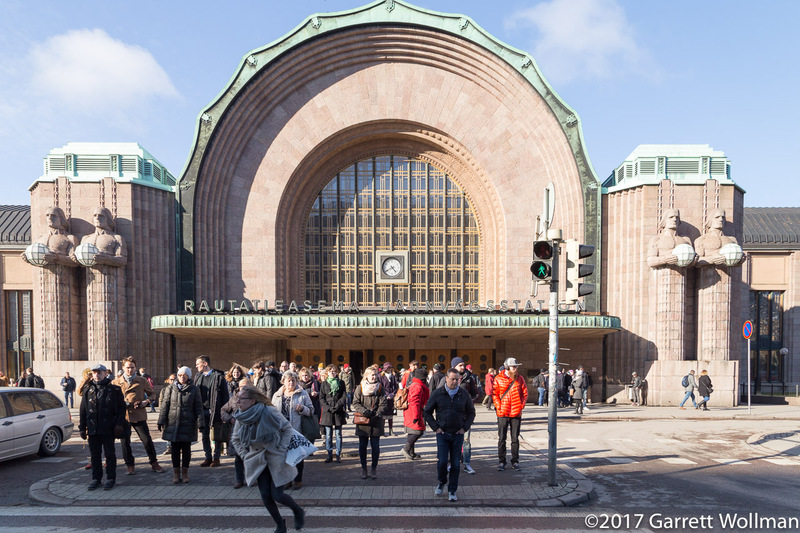 Saarinen’s design makes it abundantly clear where the entrance to the railway station (Rautatieasema/Jarnvägsstation) is, just in case the thongs of pedestrians waiting to cross the street didn’t make it obvious enough. Take some time to admire some of the details on this 1919 edifice. 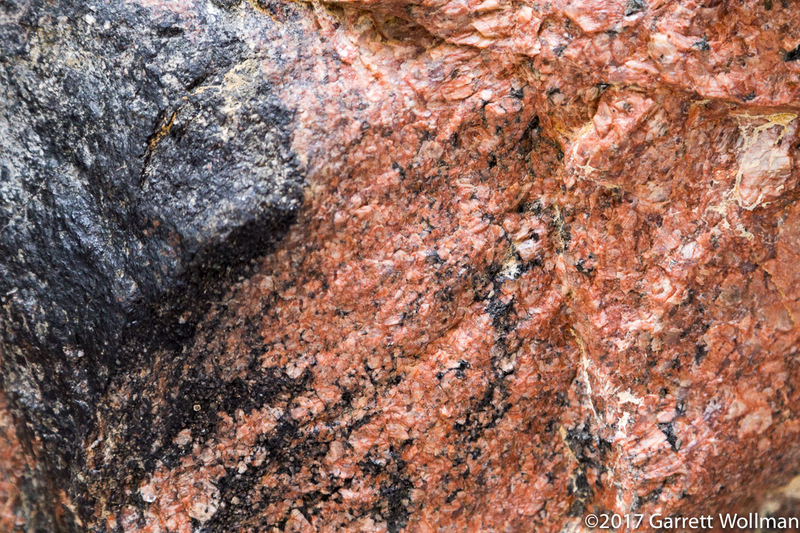 Click on the images to view in higher resolution. I noticed this sticker on one of the main doors to the station and couldn’t resist including it here. I don’t think even the more nationalist Finns think much of Donald Trump. The cobblestone plaza in front of the station, between the tram stop and the station itself, forms the roof of the Metro station concourse below ground. Seen off in the distance are Ultava restaurant and various commercial office buildings. It’s a fairly cold day in late March so everyone is still bundled up. A large number of bus routes terminate at Railway Square; note the clock tower of Helsinki Central station at left. The cobbled surface, however uncomfortable for wheelchairs and rollerbags, is common for market squares and sidewalks throughout Helsinki. At center are offices of VR Group, and at right is the Finnish National Theatre. A protest camp occupies some of the open space in Railway Square. I’ll be interested to see if they’re still there when I go back in August. 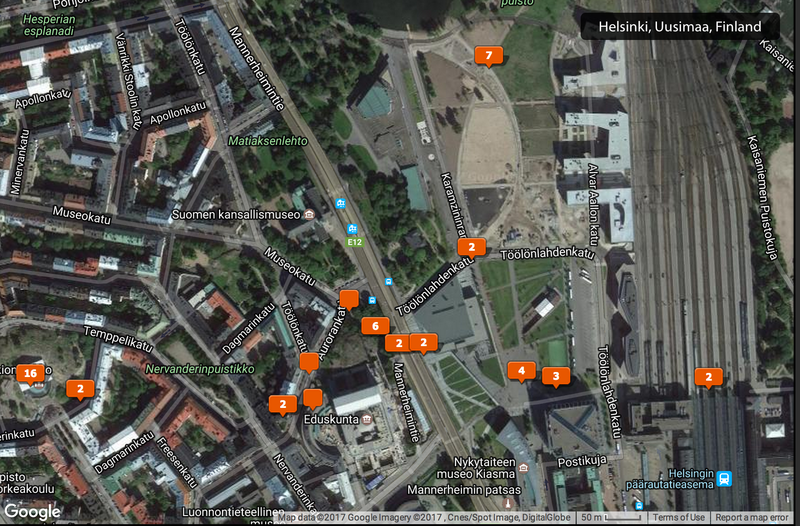 (My hotel is in Ruoholahti next time, so I’ll once again be taking the commuter rail and the number 9 tram each day.) The large sign at right advertises #EuroBasket2017 (yes, written as a Twitter hashtag). Across Kaivokatu from Railway Square is the Helsinki Ateneum, one of the art museums of the Finnish National Gallery. 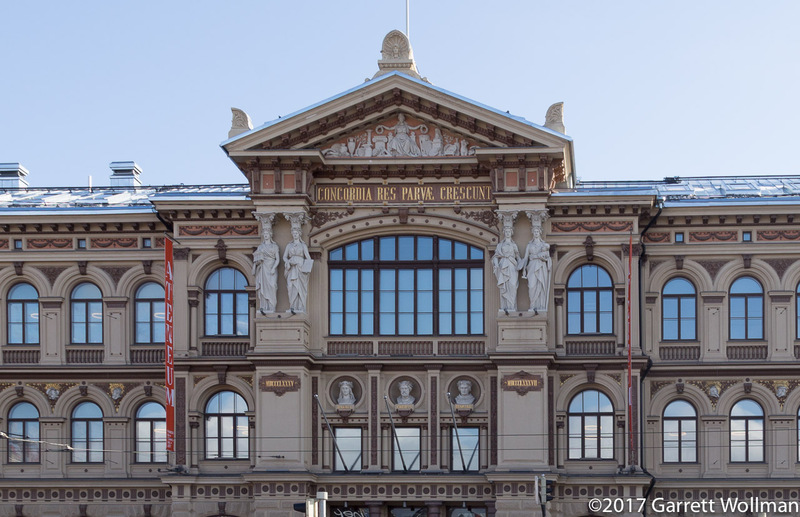 The building was designed by Theodor Höijer and opened in 1887. The Latin motto below the pediment reads “Concordia res parvae crescunt”. 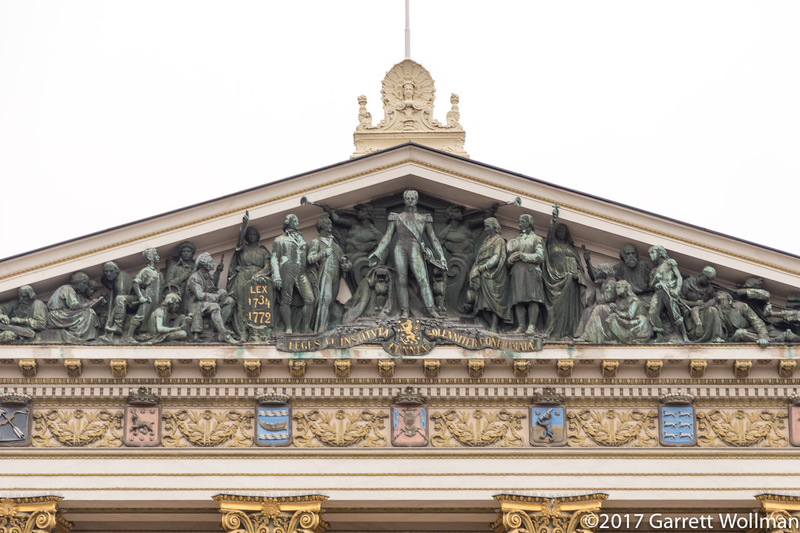 Here’s a closer view (well, digital zoom) of the pediment, symbolic busts, and caryatids of the Ateneum façade. 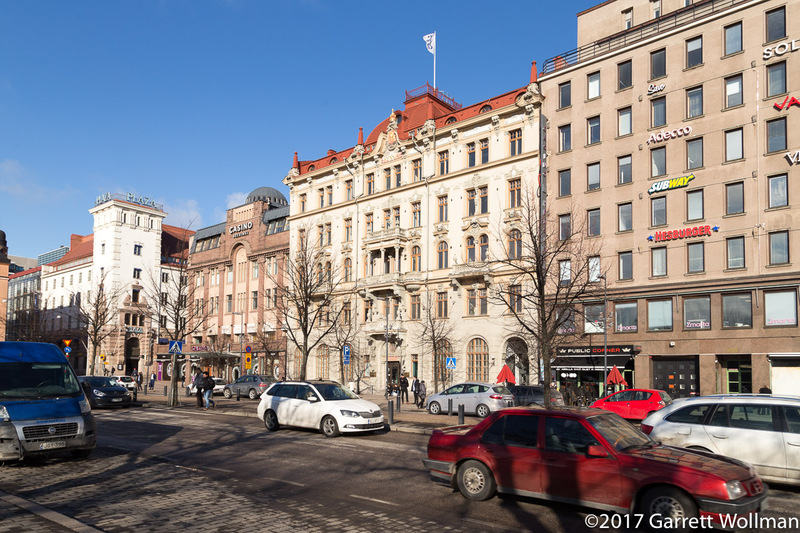 In the southeast corner of Kaisaniemenkatu and Mikonkatu, an older building is home to a cooperative bank (Osuuspankki or OP) and various street-level retail establishments. On the east side of Railway Square, a variety of older buildings serve modern functions. 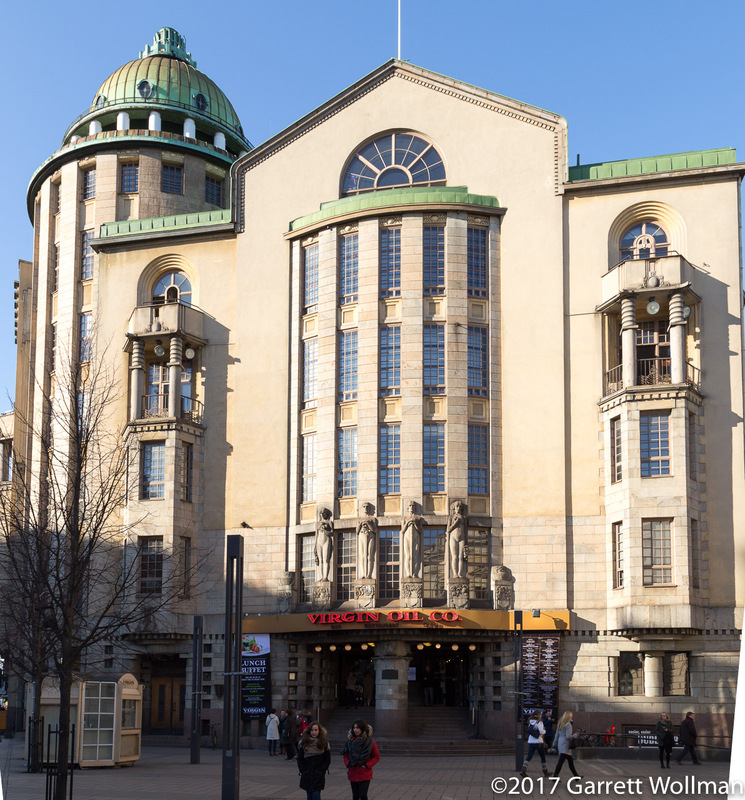 The Finnkino Kinopalatsi (“Movie Palace”) theater shares this mid-century building with the Finnish branch of Fox television (channel 12) and an assortment of smaller offices and retail establishments. 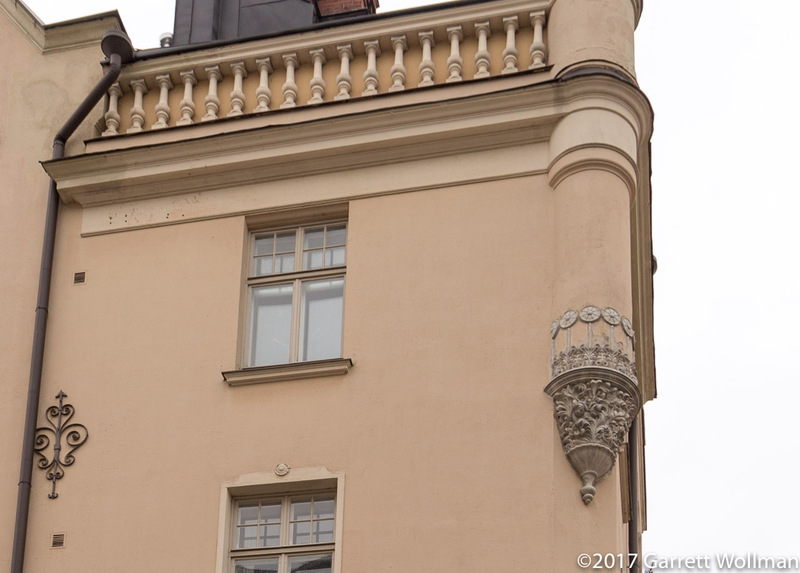 At Mikonkatu 17, still on the east side of Railway Square, squeezed between the Finnkino and Casino Helsinki buildings, is this older structure that I have no information about. It seems to be managed jointly with the Finnkino building, as is common here, as Google thinks Fox is actually located here. 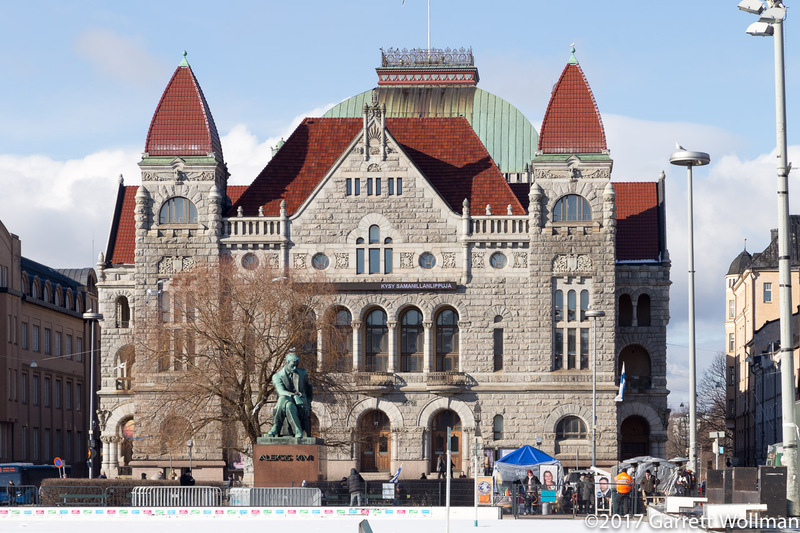 Local elections took place across Finland in early April. 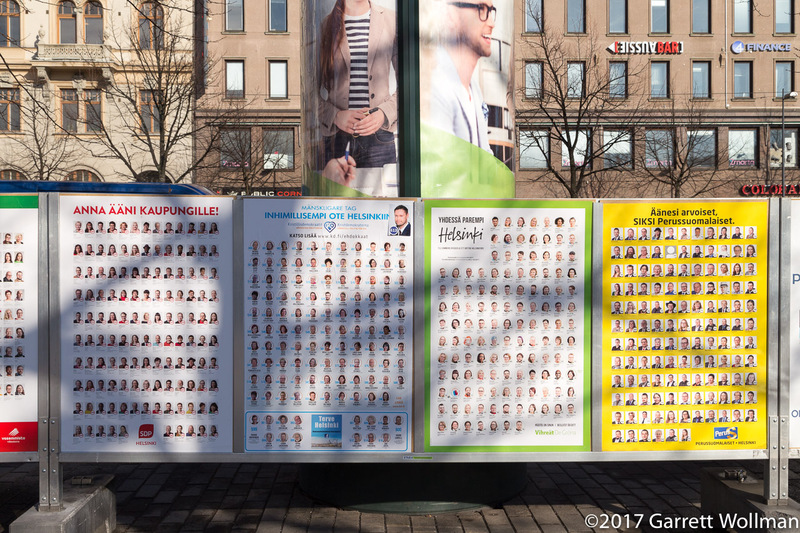 Political parties do substantial outdoor advertising; in Railway Square, all of the registered parties had the opportunity to put up a poster listing the candidates on their list. Seen here, posters for three of the less popular parties: the SKP (one of the two communist parties), the Pirate Party, and the Liberal Party. 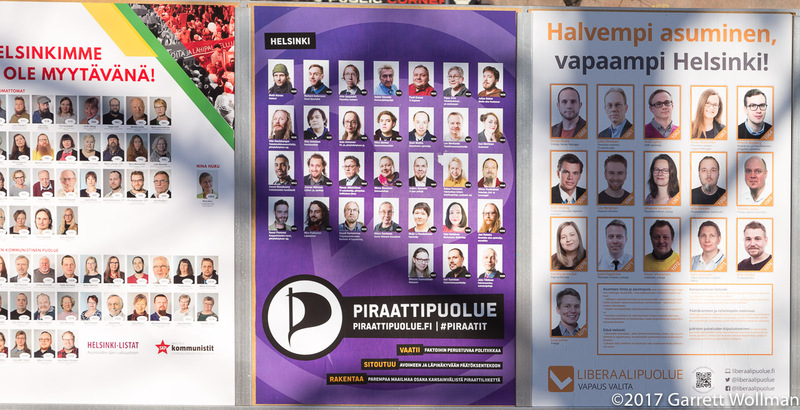 (The candidates are numbered sequentially through all the lists, and the posters here appear to be sorted by candidate numbers — the numbers are listed on the ballot paper so voters can be sure they’re voting for the right Harri Virtanen.) 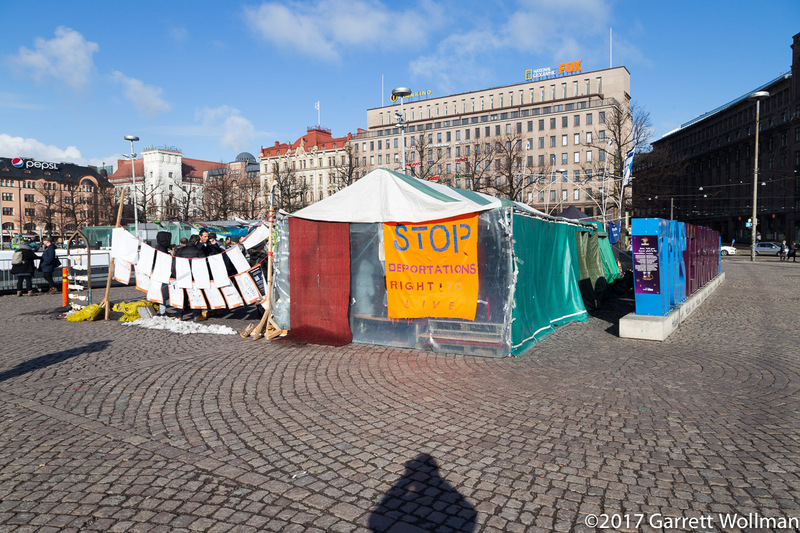 The Communists’ slogan was “Our Helsinki is not for sale”, whereas the Liberals’ slogan was “More affordable housing, freer Helsinki”. One more set of political posters, from left to right: Social Democrats, Christian Democrats Greens, and Finns. The last were the big losers in this election, losing 425 seats nationwide (36% of their 2012 total). A group of young people are chatting next to the political party posters. I don’t know if they were actually talking politics (or even old enough to vote). The remaining parties shown here, to the left of the SDP, are the Left Alliance and the Swedish People’s Party, plus a couple more I can’t identify (one of which must be Kokoomus, National Coalition, the main center-right party in Finland). Suomen Kansallisteatteri, the Finnish National Theatre, is located on Railway Square just east of Helsinki Central Station. The theatre was established as an organization in 1872, and this building was constructed in 1902 specifically to house it. 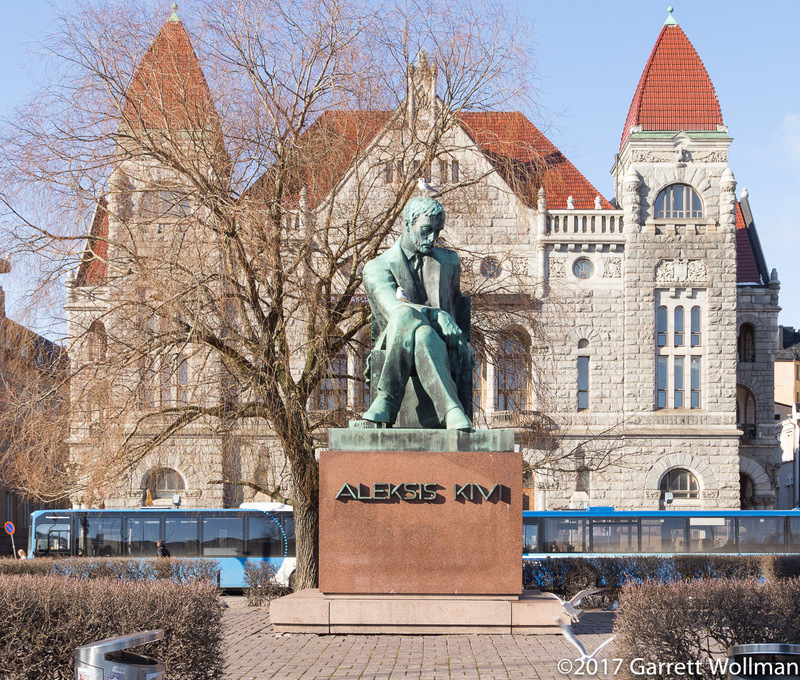 The building was designed in the “National Romantic” style by Finnish architect Onni Tarjanne, and in front is a statute of the 18th-century romantic writer Aleksis Kivi. During election season, the parties set up booths where they hand out free coffee (or other beverages) and information about the candidates on their list. 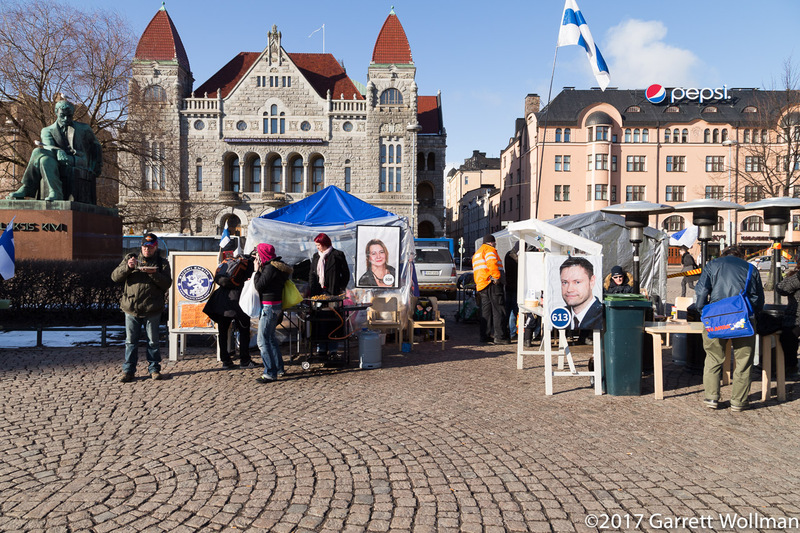 At left, next to the statue, is a booth for the Finland First list, which does not appear to be a registered party. Aleksis Kivi (1834–1872) was a playwright, poet, and the first significant Finnish-language novelist. His statue here in Railway Square is appropriately set in front of the National Theatre building. Unfortunately, I can’t find any details about what this building used to be. 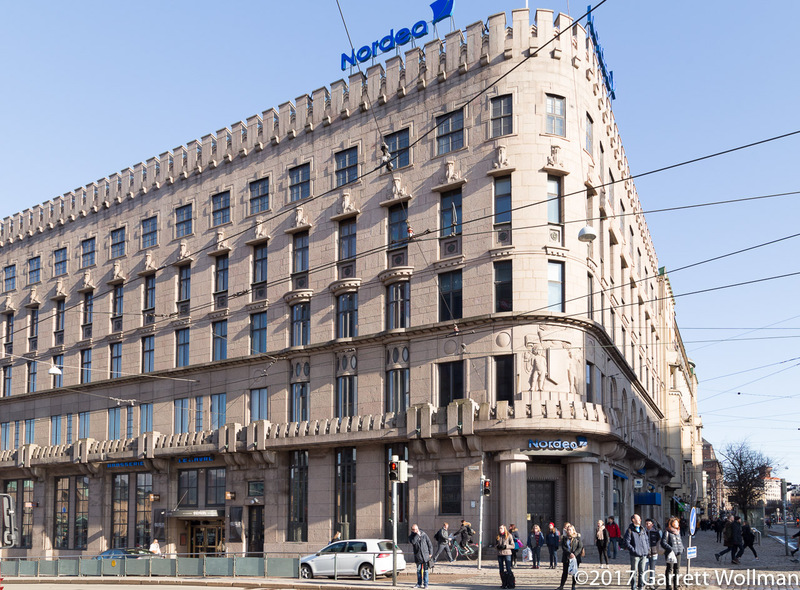 Nordea is descended from two of Finland’s largest pre-EU banks, Kansallispankki (National Bank) and Suomen Yhdyspankki (Union Bank of Finland), along with banks from other Nordic countries. When I was in Finland as a student, I had a passbook savings account with SYP. On Mannerheimintie, between Aleksanterinkatu and Kaivokatu are a number of buildings and institutions related to the University of Helsinki, whose modern-day campus is located half a kilometer away. This building houses the Student Union. 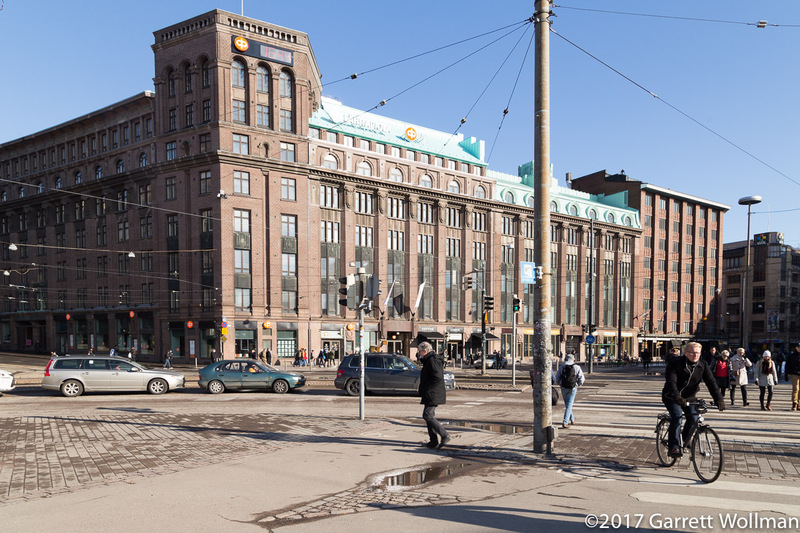 At Aleksanterinkatu, the tram stop is named Ylioppilastalo “University student house” — but the most notable institution there is the main Stockmann department store. 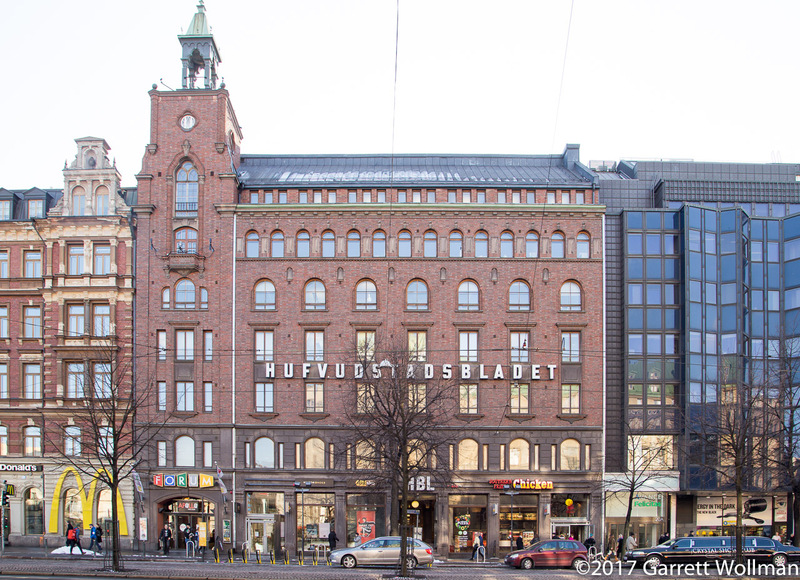 Hufvudstadsbladet , “The Capital Journal”, is the principal Swedish-language newspaper. 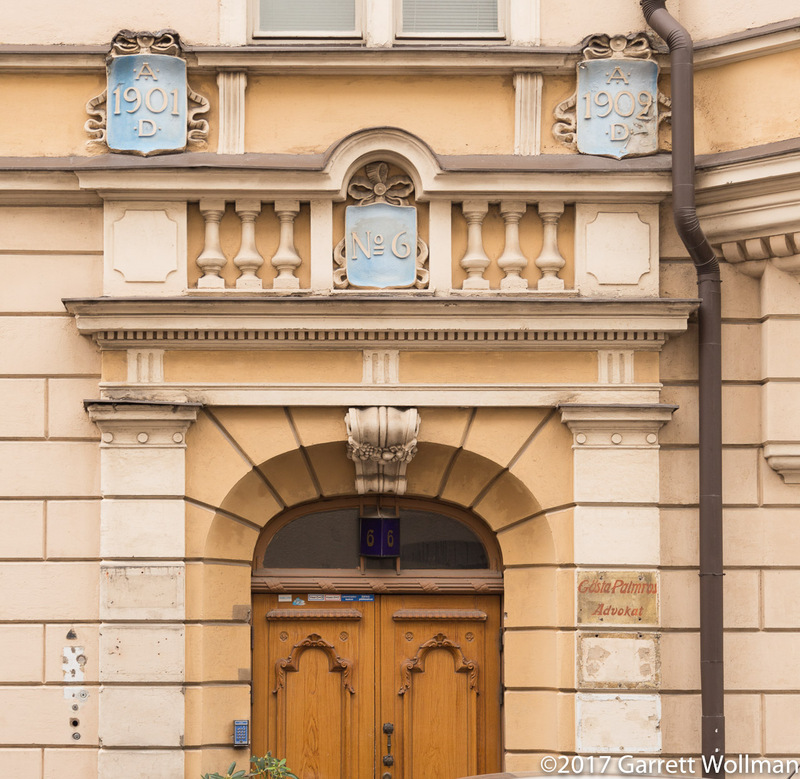 I have no clue what this building on Mannerheimintie used to be — presumably not an Italian restaurant. 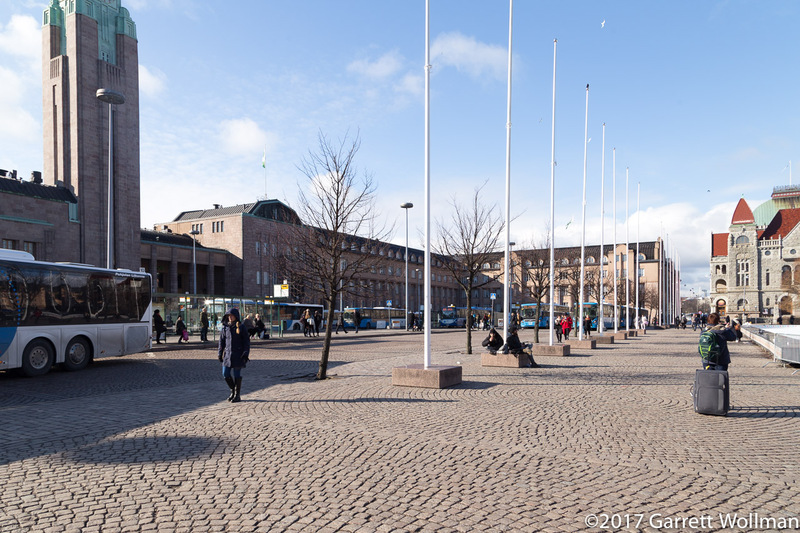 It faces a pedestrian way called Ylioppilasaukio, “University student plaza”, which marks where Yliopistonkatu would meet Mannerheimintie if it did not end two blocks east of here. 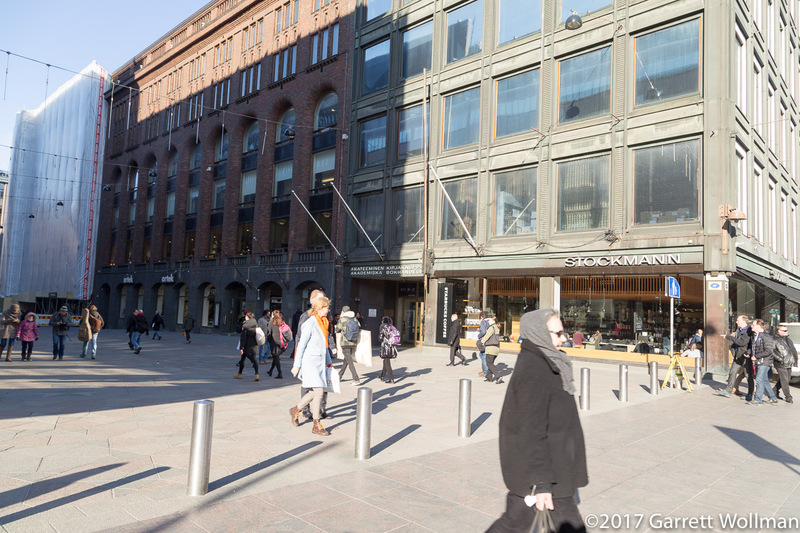 This is the Finnish equivalent of Macy’s Fifth Avenue store in Manhattan — the main branch of the Stockmann department store. 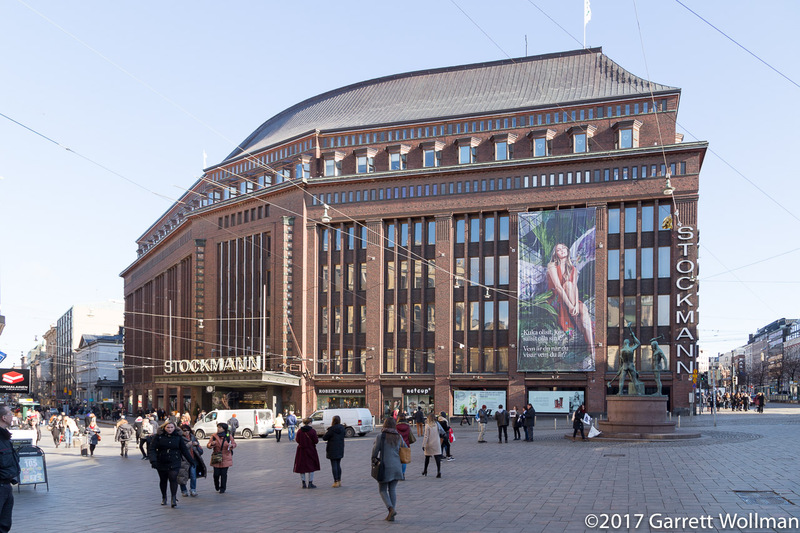 Stockmann occupies this entire building, a truncated triangle in shape, and historically also occupied some of the surrounding buildings as well. The main shopping street of Aleksanterinkatu heads off to the east at left, towards Senate Square; Mannerheimintie runs north-south at right. 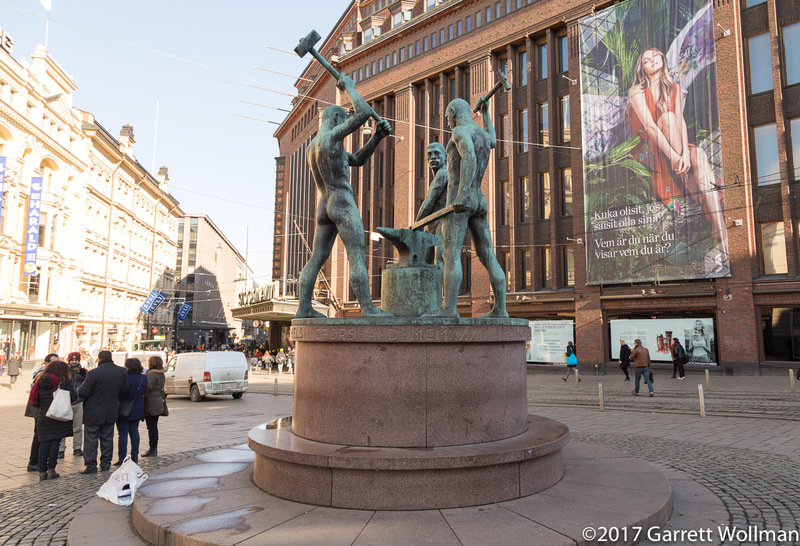 Kolme seppää, “Three Smiths”, is a statue at the west end of Aleksanterinkatu (at Mannerheimintie), across from the Stockmann main branch. 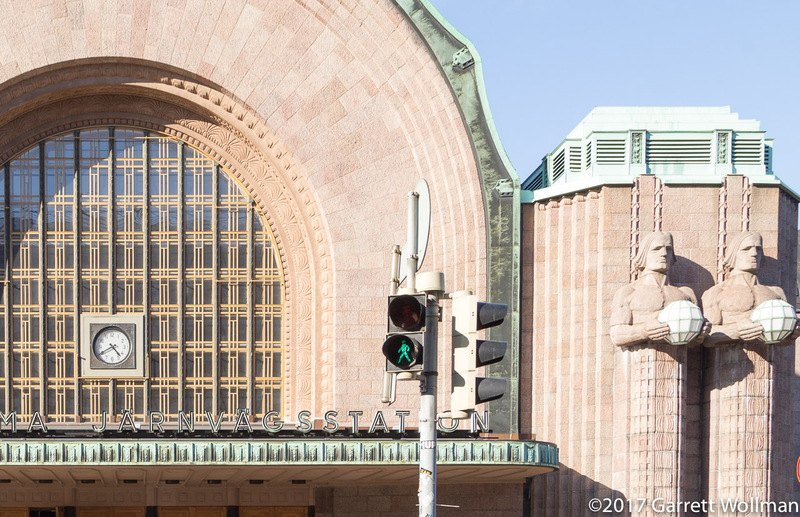 It was sculpted in 1932 by Felix Nylund (1878–1940). Looking east down Aleksanterinkatu, past the Stockmann store, you can see other shops, shoppers, and trams. It’s quite crowded, and the trams move slowly. Behind me is the Three Smiths statute. 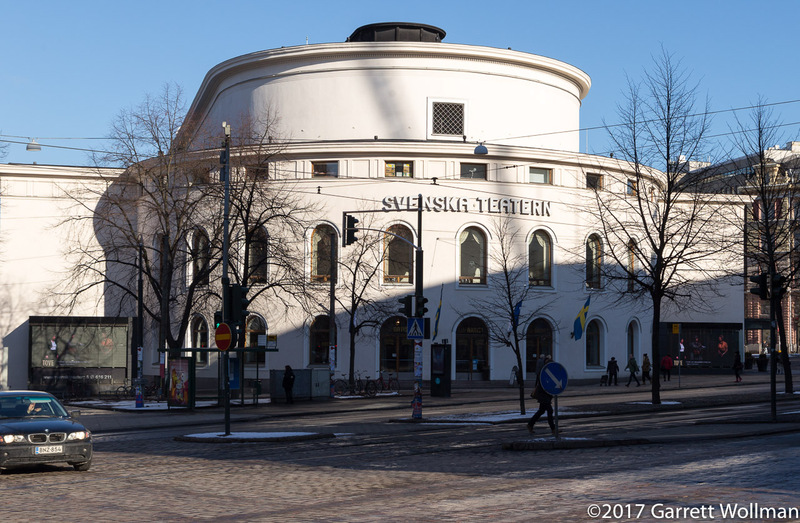 This end of Mannerheimintie is home to a number of of Swedish-language institutions; previously we saw the home of Hufvudstadsbladet , the Swedish-language newspaper, and now, where the North Esplanade meets Mannerheimintie, it’s the Swedish Theatre. 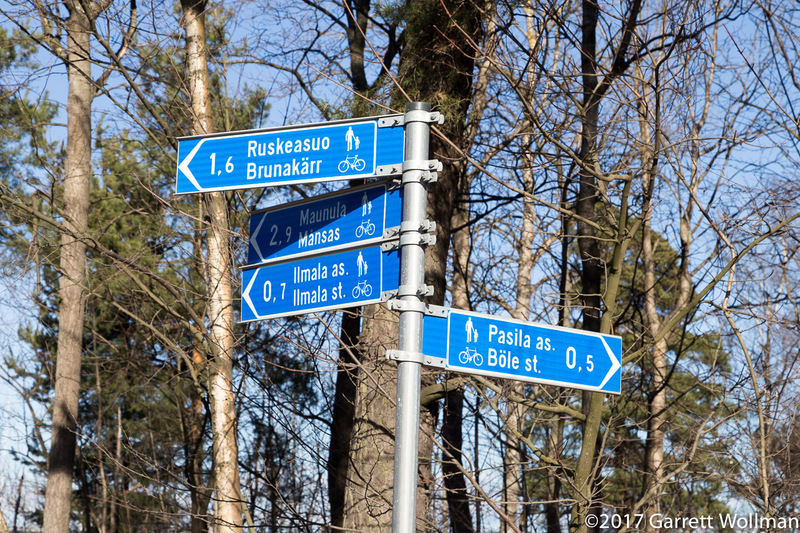 Nearby is Erottaja, the zero point for distances to or from Helsinki city center. 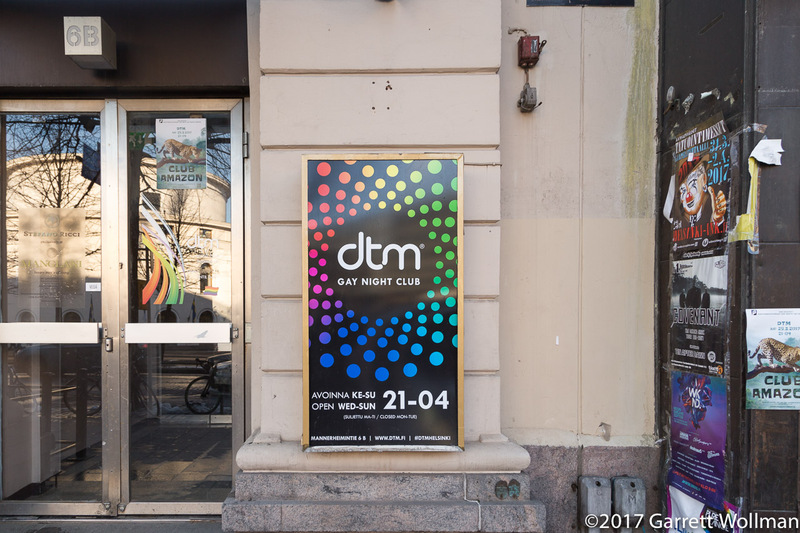 I thought this gay club was an interesting example of how — even in a Swedish-bilingual city, English often takes precedence over Swedish on commercial signage. The club is on the west side of Mannerheimintie, across the street from the Swedish Theatre. Like many large buildings in Finland, the Stockmann store consists of multiple adjoining structures of different ages (or at least multiple building shells of different ages). 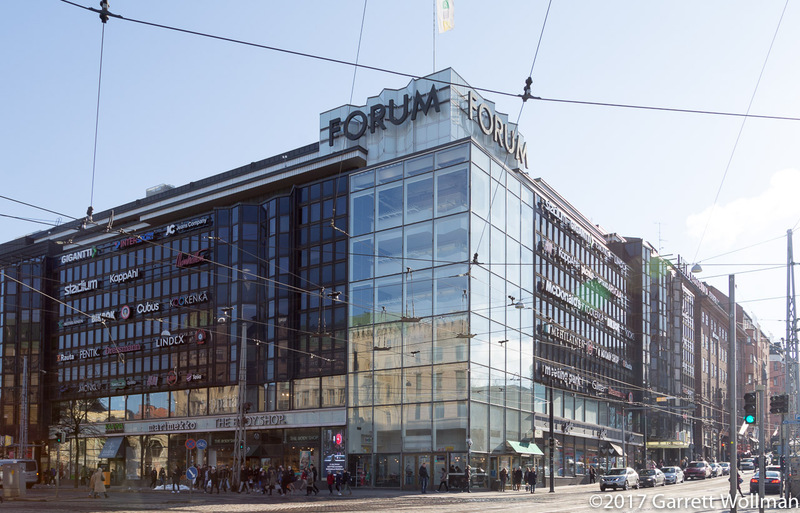 The south end of the main Stockmann store, facing the Swedish Theatre across North Esplanade, looks older and quite a bit more ornamented than the north side — and at right you can see a more modern glass-and-steel structure on the corner of Keskuskatu. Across Keskuskatu from the main Stockmann store is more Stockmann. 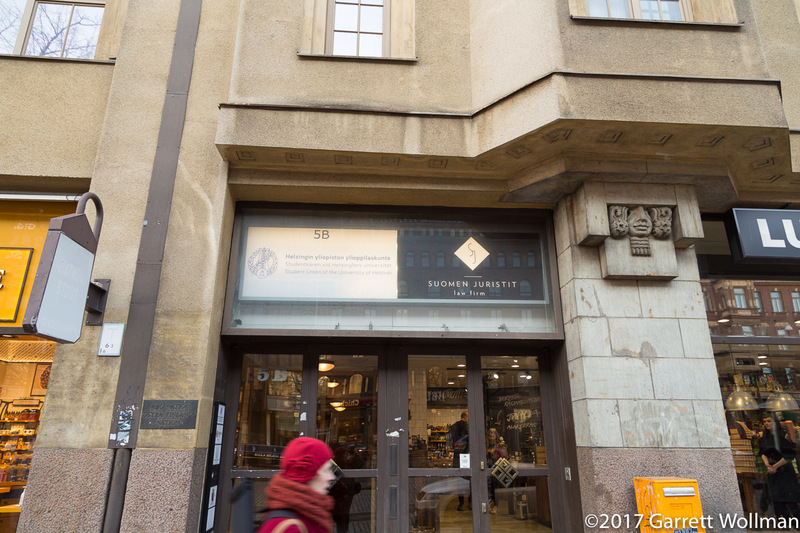 At center, on the edge of the shadow, is the entrance to Akateeminen Kirjakauppa, “Academic Bookstore”, which was for many years owned by the Stockmann company and Finland’s largest retail bookseller. Helsingin Tuomiokirkko, or Helsinki Cathedral, is one of the architectural must-see sites on every tourist guidebook to Helsinki. It’s a Lutheran church, so there’s not much statuary and no stained glass. I didn’t go inside, and in fact wasn’t even planning on passing by originally, but since I took a wrong turn and it’s an interesting building, I stopped for a photo. 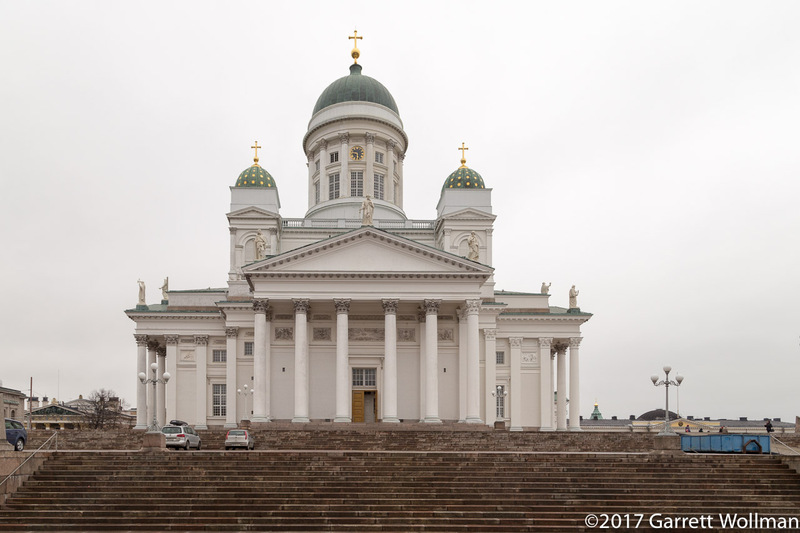 The church was built between 1830 and 1852 and was designed by the German architect Carl Ludvig Engel (1778–1840), who is responsible for many of Old Helsinki’s monumental buildings; it was later altered by Ernst Lohrmann (1803–1870). Another side of the cathedral faces Senate Square, but I didn’t pass that way. A short walk down Kirkkokatu from Helsinki Cathedral brings us to the Bank of Finland building on Snellmaninkatu. 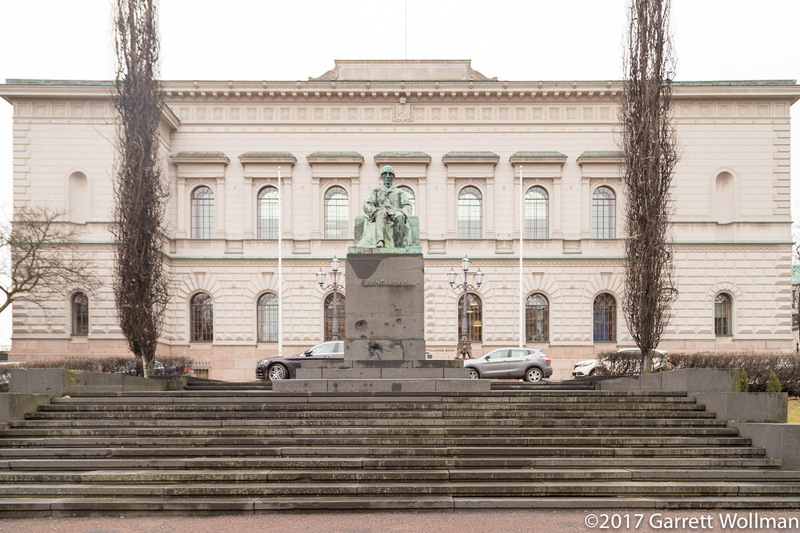 The statue in front of the building is none other than Johan Vilhelm Snellman himself. Immediately across Snellmaninkatu (behind me) is the House of the Estates. Johan Vilhelm Snellman was a Swedish-born Finnish philosopher, university lecturer, polemicist, and statesman. 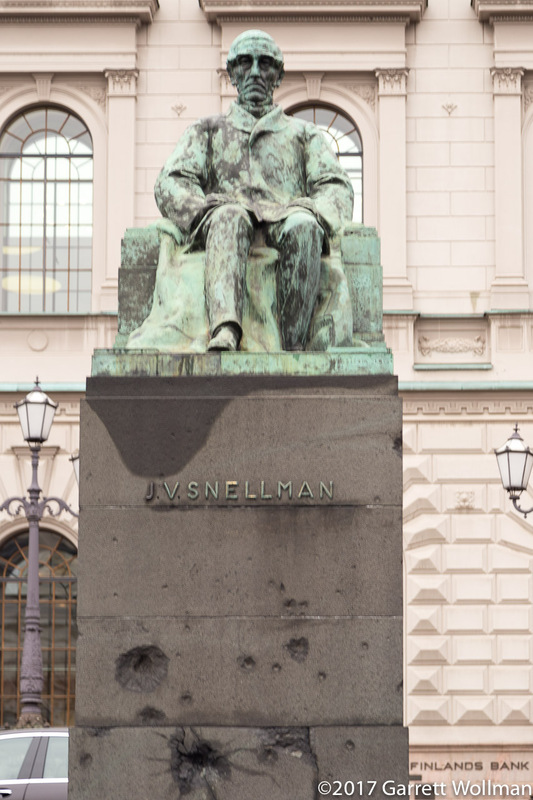 As finance minister in 1865, Snellman was responsible for the introduction of a national Finnish currency, the mark (in Finnish, markka), so it makes perfect sense for his statute to be located in front of the Bank of Finland, on the street that bears his name. Looking north along Snellmaninkatu from the Bank of Finland, on the other side of Rauhankatu is the National Archives (Kansallisarkisto). 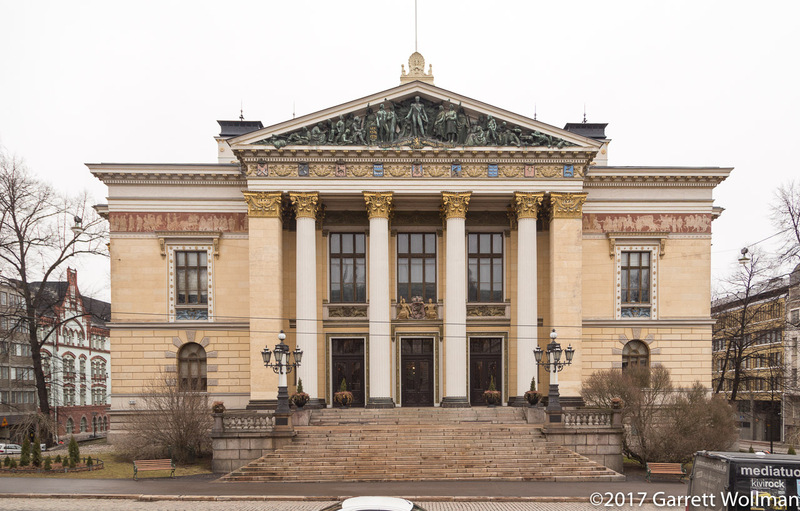 Säätytalo, “House of the Estates”, was the seat of the quadricameral Finnish parliament prior to early 20th c. reforms that replaced it with the unicameral Eduskunta. A closeup of some of the exterior details on the House of the Estates. 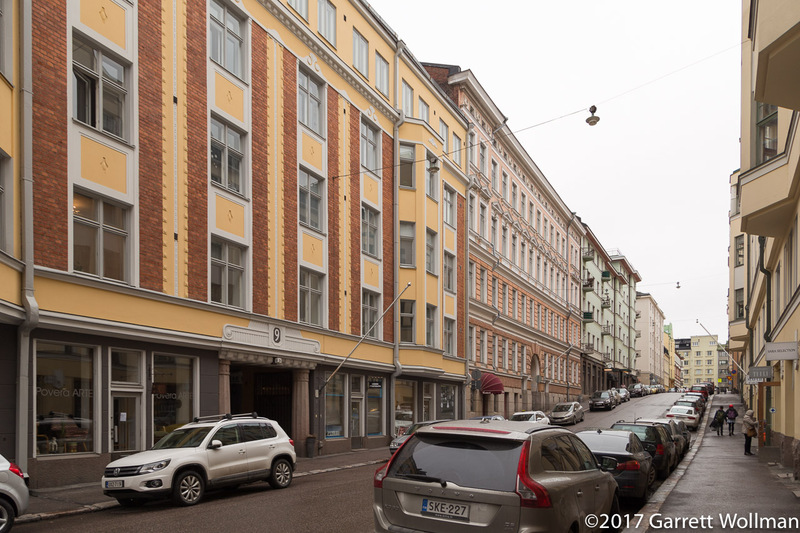 This building at Snellmaninkatu 13 occupies the fourth corner of the intersection of Rauhankatu and Snellmaninkatu, and is the only commercial building here. The Society of Swedish Literature in Finland is here, as is the Forest Industry Association. 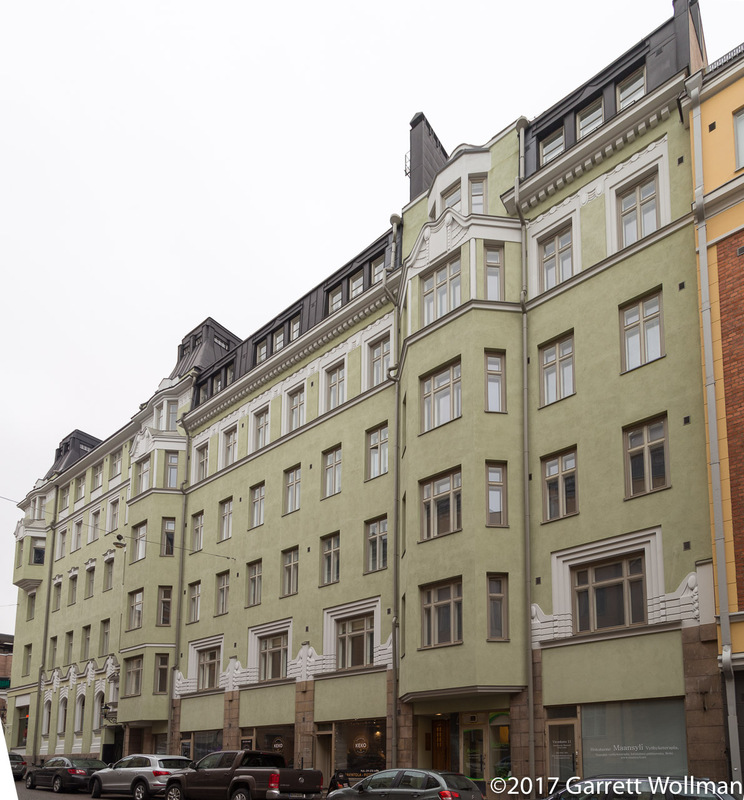 Ground-level tenants include restaurants and the Federation of Finnish Learned Societies’ bookstore. 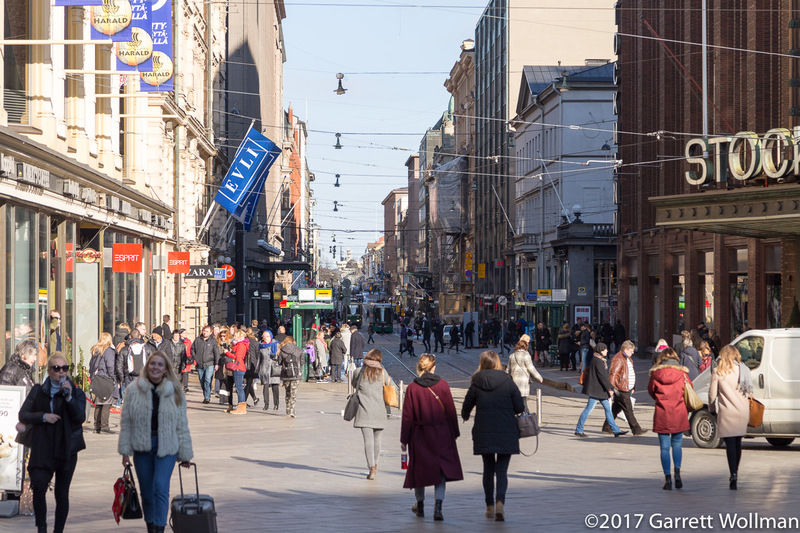 In Helsinki and other Finnish urban centers, it’s common for street signs to be attached to the corners of buildings at the intersection rather than mounted on a pole as is normal in the US. 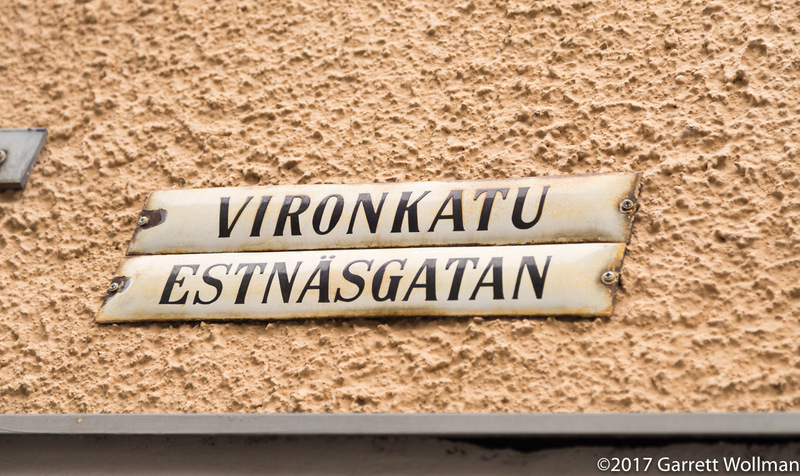 This sign is for Vironkatu, “Estonia Street”, our destination for this excursion. I took a bunch of photos of buildings along Vironkatu like this one, but my lens was not wide enough to get good, upright photos of most of the buildings. 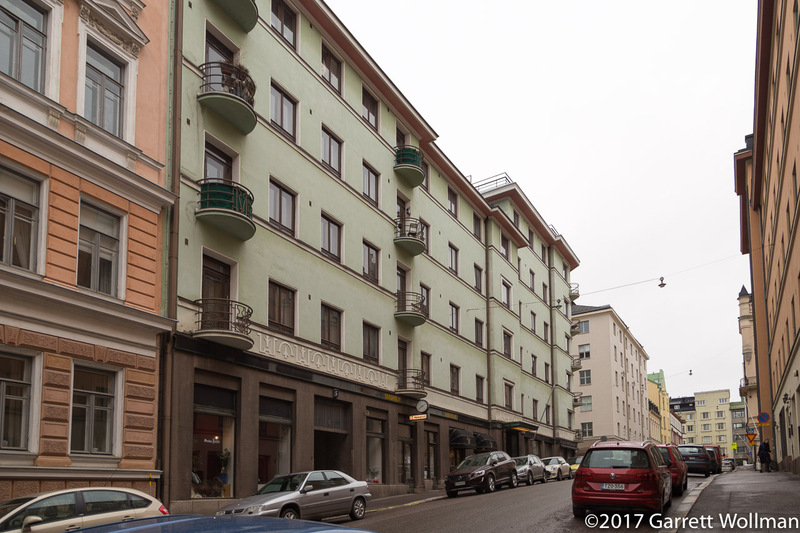 As with much of this part of Helsinki, Vironkatu is lined with a mix of 19th and 20th-century buildings, butting against each other in the style of pre-automobile cities everywhere. You can see that the yellow building, Vironkatu 9, is in an obviously different style from the green building we just saw, and it’s also different from the building on the near side of the street with the overhanging balconies. When these buildings were constructed, there were no historic preservation laws demanding that the architects maintain a consistent style with those that came before — and so the whole street is a hodgepodge of different colors, styles, and functions, representing the fashions of the day. 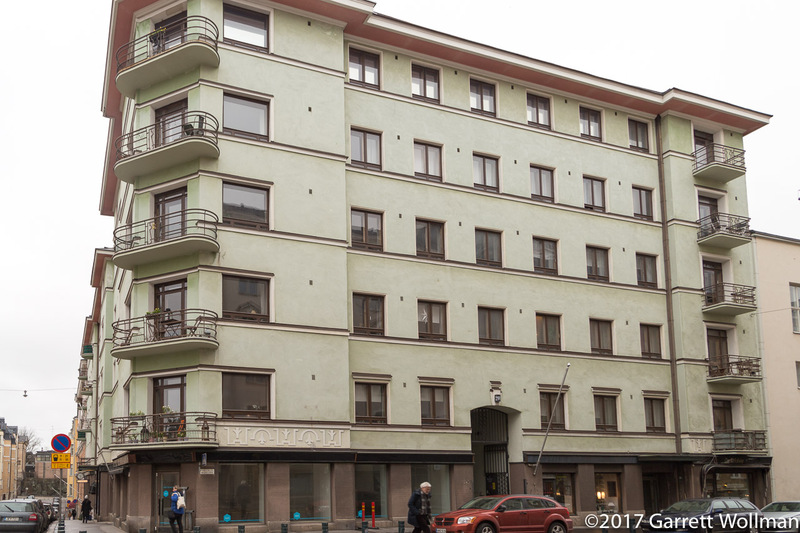 Moving down the street a bit, the green building with the balconies is Vironkatu 5 — I’m guessing from the exterior details that it was built in the 1920s or 1930s. 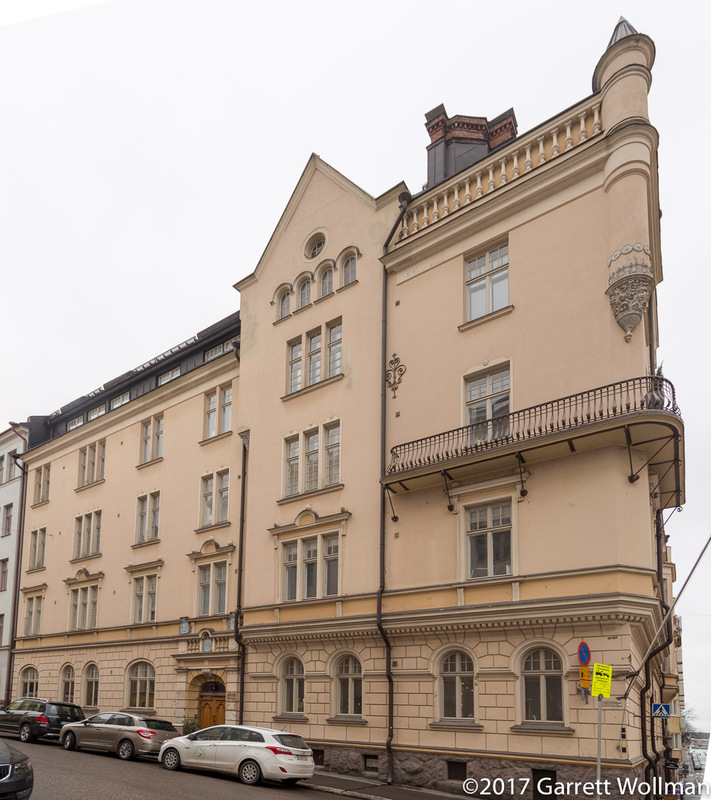 Thanks to the Helsinki City Museum, I now know that the building was originally built in 1857, but the current façade dates to a 1935 renovation project under architect Matti Finell. Finnish street numbers are typically not very large: there is no tradition of block-based numbering, not even in districts (like this part of Helsinki) that have fairly rectilinear street patterns. 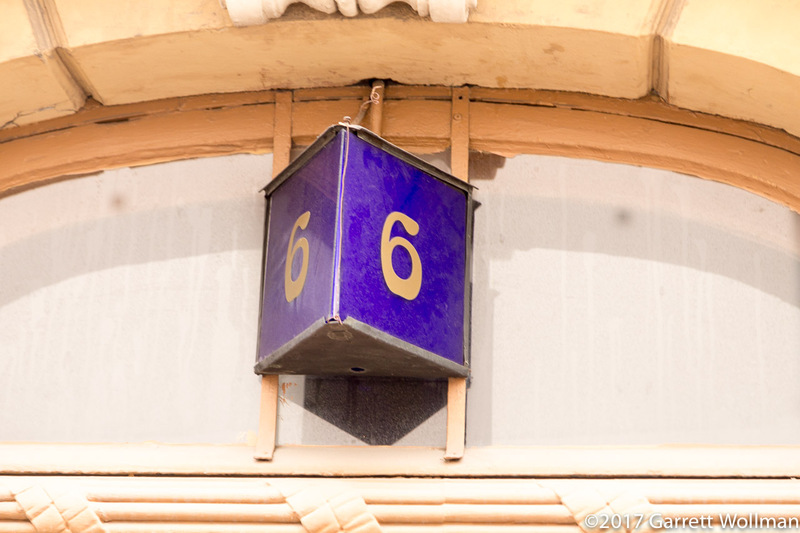 Street addresses in cities will typically identify a building number, a stairway number, and an office number — all written after the name of the street. This is Vironkatu 6. We are here because, back in 1988–89, the Youth for Understanding exchange agency’s offices were at Vironkatu 6 A 11 — that’s number 6 (this building), stairway A (the brown wooden door next to the white car), suite 11. In doing the research for this, I found that number 11a (which I suspect is a partition of the old no. 11) is for sale; it can be yours for the paltry sum of 850,000 euros. 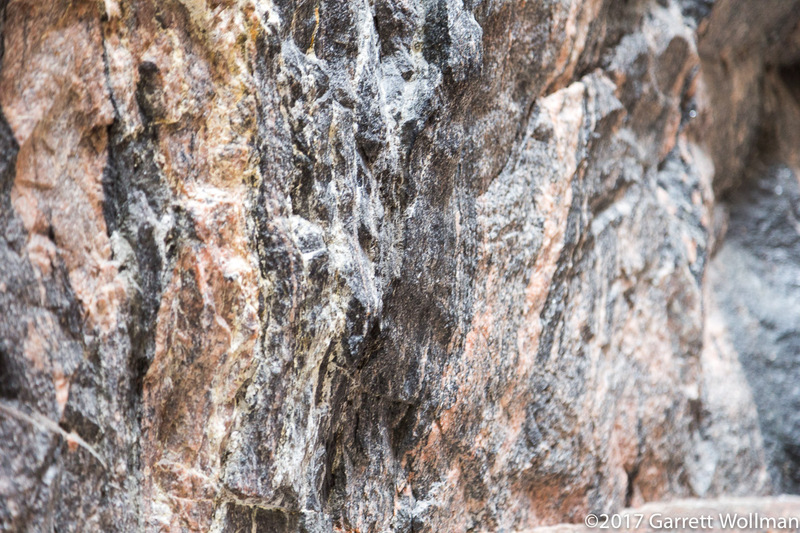 Here’s a close-up of some of the exterior decoration on Vironkatu 6 (with is also Mariankatu 15b). 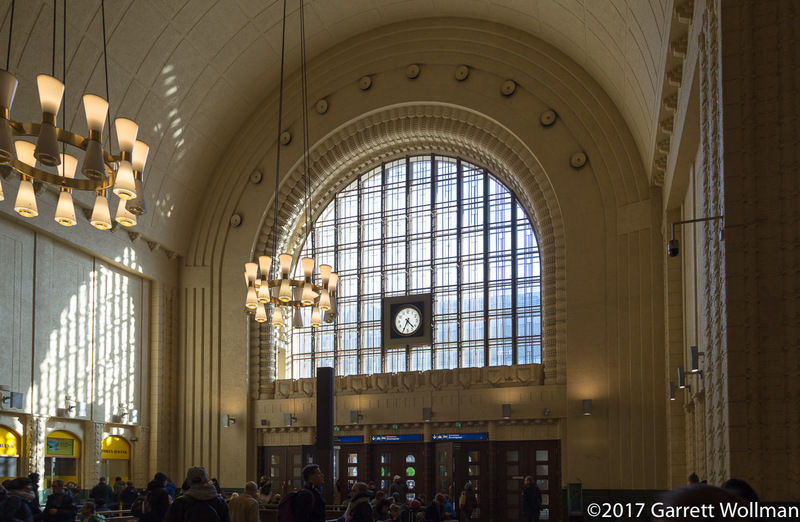 The building was constructed in 1901 under the architectural firm of Grahn, Hedman & Wasastjerna. A photo from the Helsinki City Museum shows that the bit hanging down on the corner was not always there. Here’s a better look at the decoration surronding Vironkatu 6’s entrance. Note the “1901” plaques confirming its construction date — and note also the absence of any modern tenants’ signs. The Vironkatu 6 A 11 that I remember — I visited the YFU offices several times — was on the second floor, behind those three windows at left. My whole group started out here for orientation classes; those of us whose host families were not in Helsinki stayed with other volunteers for a few days. 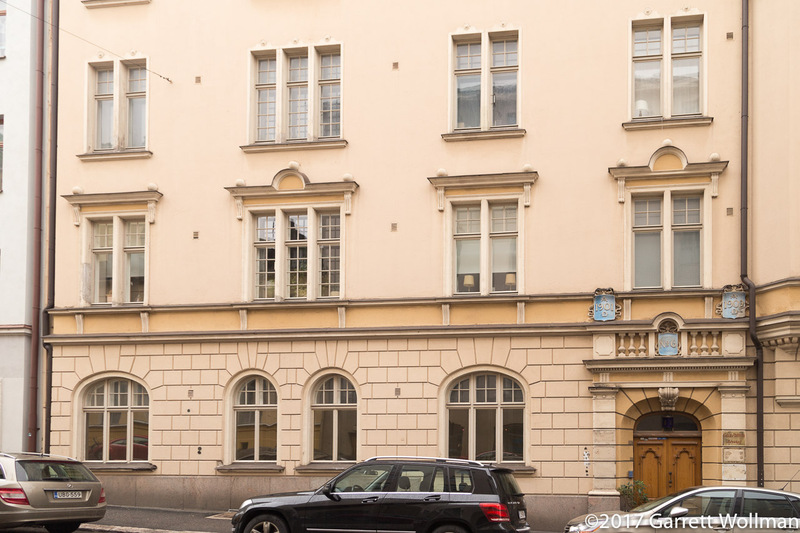 This is the Mariankatu 20 façade of the building we already saw under its alter ago, Vironkatu 5. The bank branch on the corner apparently dates to the 1970s. We’re in the university district here, at the corner of Snellmaninkatu and Yrjö-Koskisen katu looking north towards the end of Snellmaninkatu. The tram tracks here turn left (west) onto Liisankatu, but Snellmaninkatu continues one more block to end at Siltavuorenpenger (“Mountain bridge embankment”, whatever that means). 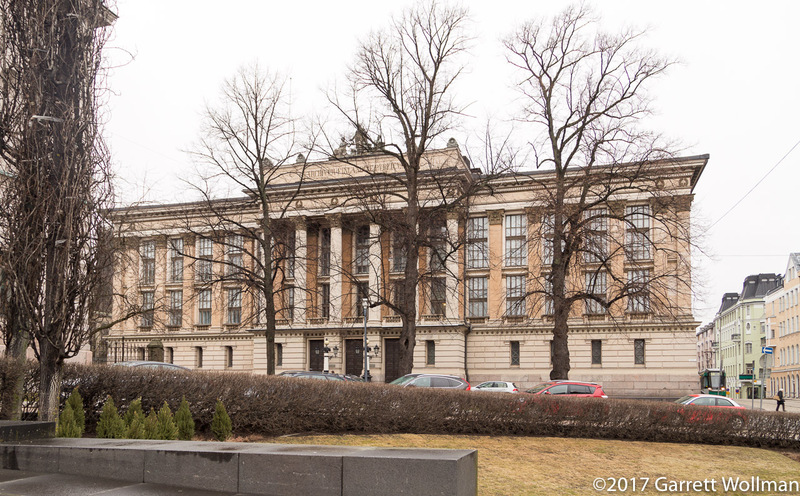 The building at the end of the street belongs to Helsinki University; on the front it says “Institutum Physiologicum” but I don’t know what it’s used for today — my Google searches suggest that it’s part of the Faculty of Educational Sciences. Technically, there is no such neighborhood as “Töölö”; collectively, it refers to two neighborhoods, Etu-Töölö (“Front Töölö”) and Taka-Töölö (“Back Töölö”). The neighborhood of Etu-Töölö is home to numerous national political and cultural institutions, including the Eduskunta (Parliament). I took this screenshot from the “Map” module of Adobe Lightroom just to give a sense of how close all of these things are to each other. On this the last day of my trip, we’ll start on in the lower right with Temppelinaukio Church and then head east to end up at the train station. 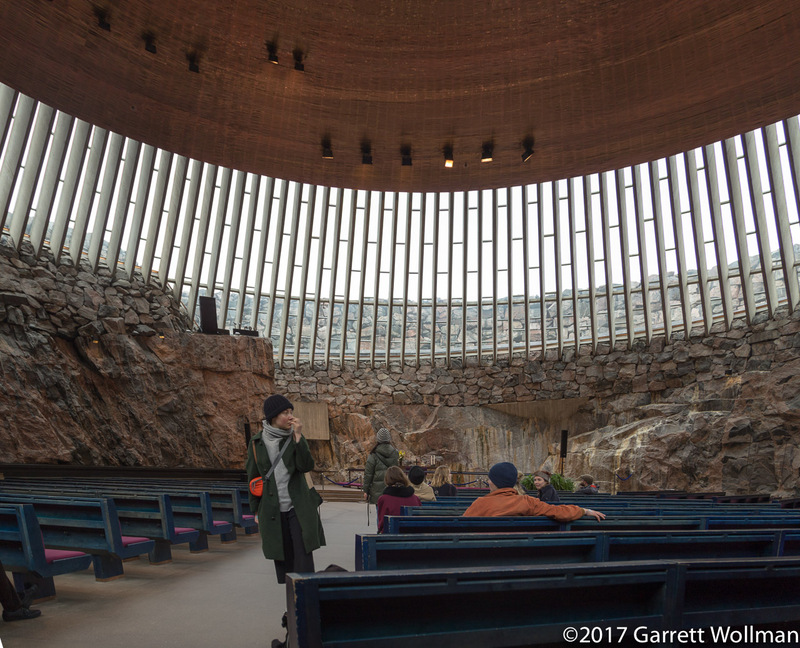 Believe it or not, this is another Lutheran church — and also another Helsinki architectural must-see. 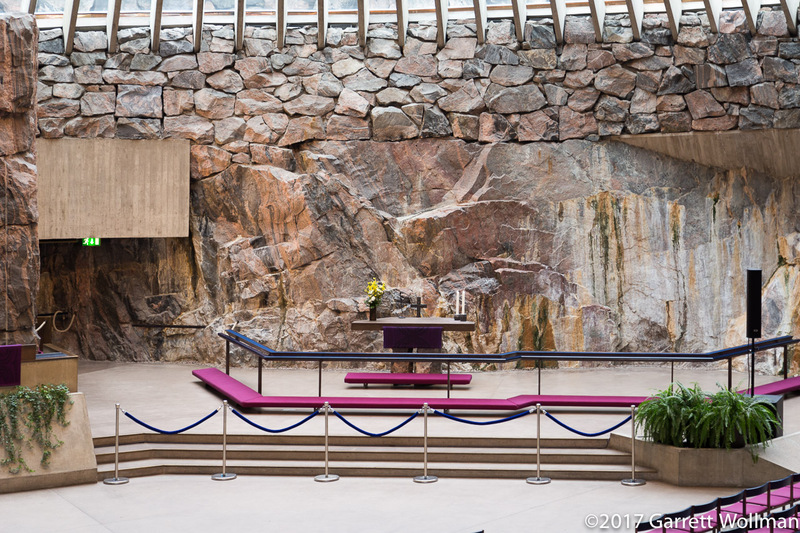 On Lutherinkatu, a short walk from the parliament building and Finlandia Hall is Temppeliaukion kirkko, also known as “The Church in the Rock”. 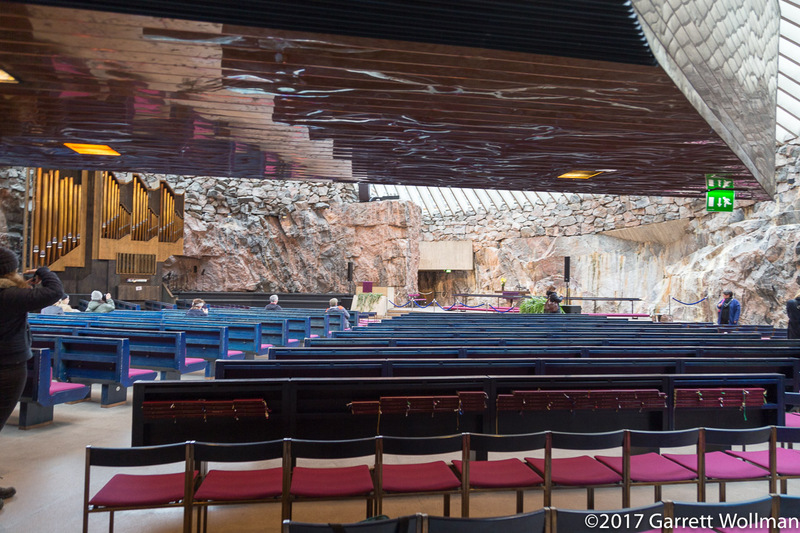 Opened in 1969, the church was carved into the rock outcropping seen at left. 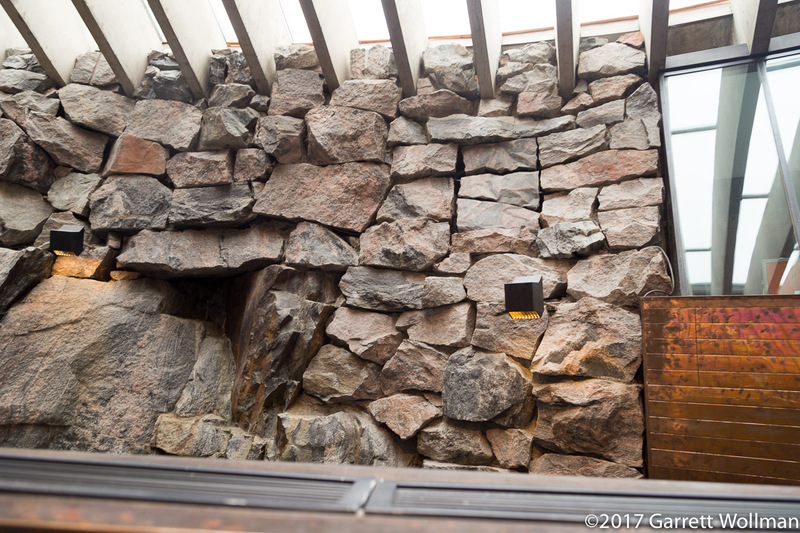 The architects were Timo and Tuomo Suomalainen. Unlike with the Helsinki Cathedral, this time I actually went inside. As a tourist destination, the church collects an entrance fee (waived for members of its congregation) of three euros. 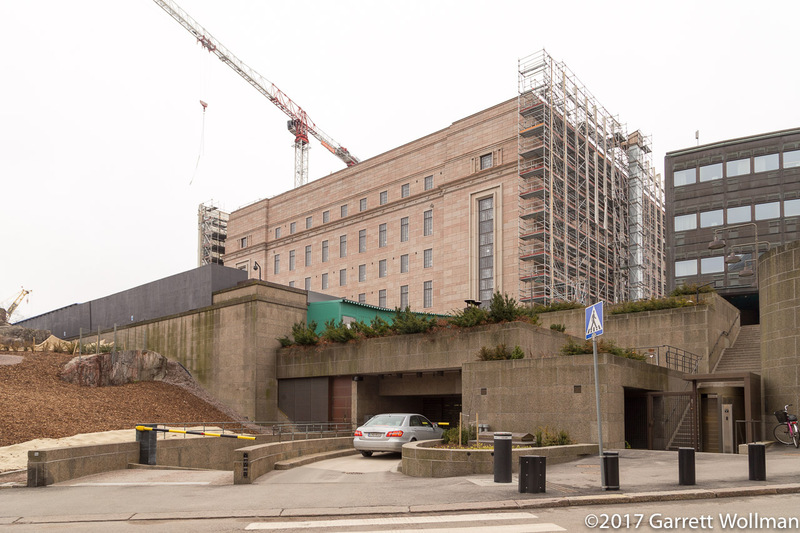 The back side of the Eduskunta (Parliament) complex is taken up by the semicircular parliamentary library, one of the few buildings in the complex that is open to the public during the current renovation project. There is a parking garage for the parliament underneath the library. 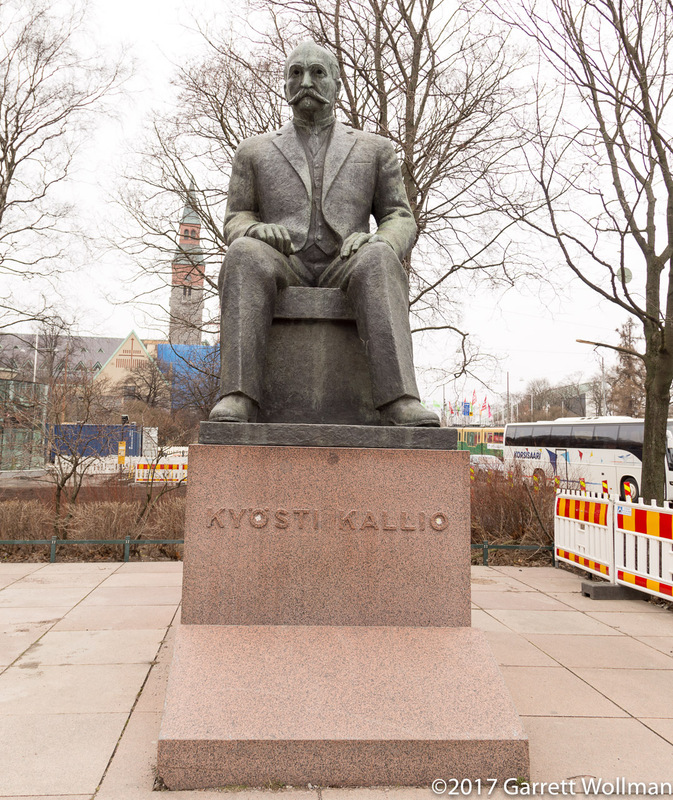 Kyösti Kallio was four times prime minister of Finland and president from 1937 to his death in 1940. Seen behind and to the left of the statue is the National Museum of Finland. 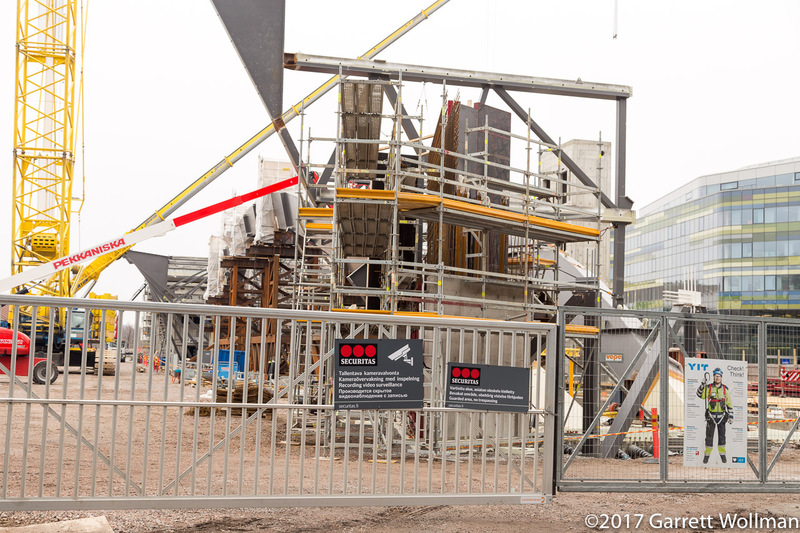 Public access to the parliament buildings and grounds is very limited during the construction, which is scheduled to be completed in time for Finland’s centenary in December, 2017. Across the street from Parliament is the Helsinki Music Centre, part of a row of cultural institutions along this stretch of Mannerheimintie. 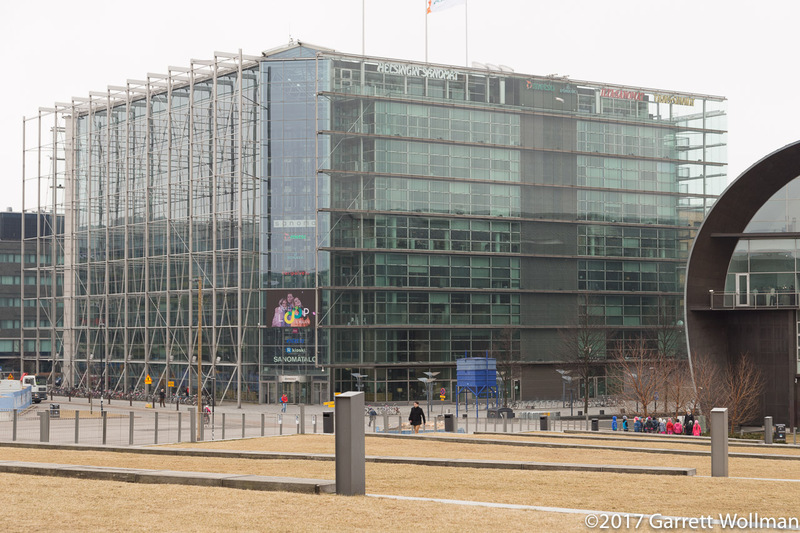 This building is the corporate headquarters of Sanoma, Finland’s leading private media company, publishers of the daily newspapers Helsingin Sanomat and Ilta-Sanomat and operator of Nelonen, the fourth television station in Finland. 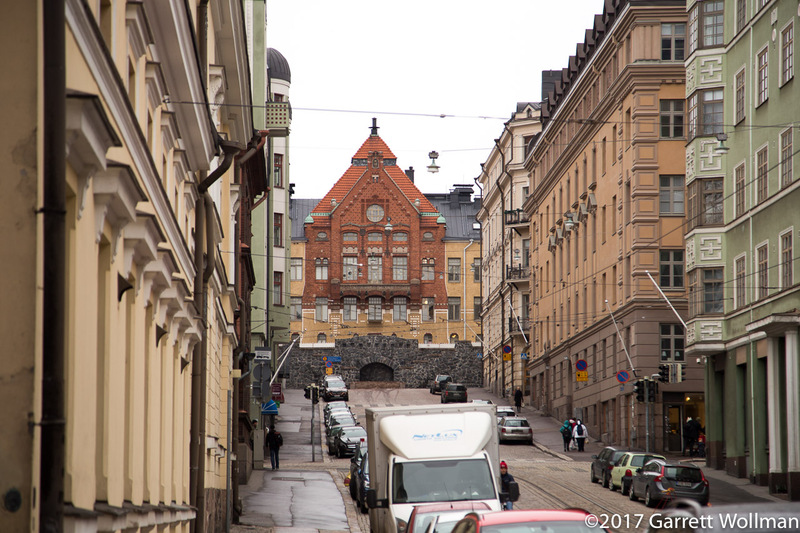 It backs up onto the railway tracks leading into Helsinki Central station, but its street address is Töölölahdenkatu 2. Just south of the Music Centre along Mannerheimintie is Kiasma Museum of Modern Art. I made a mental note to myself to get a picture from the front, but then never did — hopefully I’ll remember to fix that in August! I don’t know what this sculpture is. It’s along Töölölahdenkatu near the Music Centre and Finlandia Hall. So, um, this is Finlandia Hall. 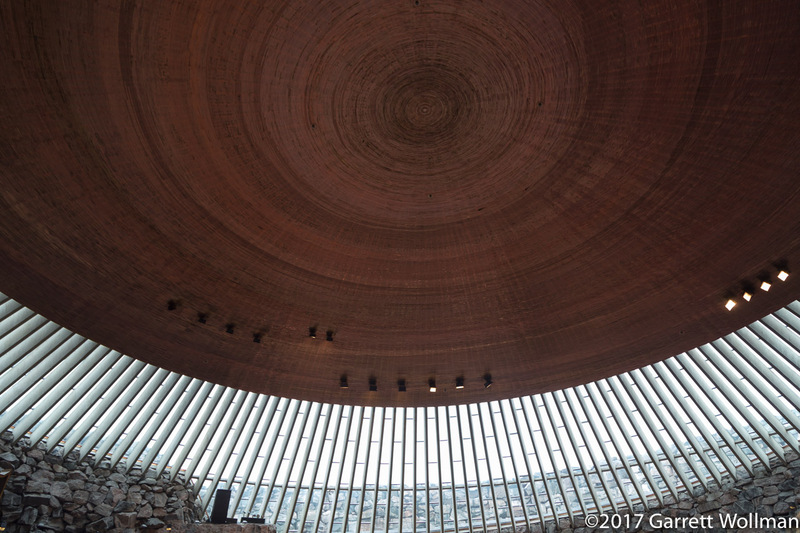 If you’ve heard of no other building in Finland, you’ve probably heard of this one. 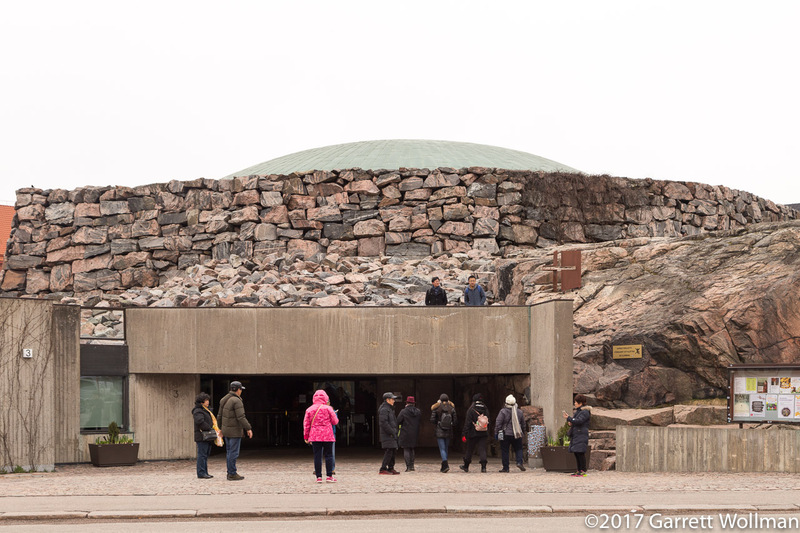 Designed by Alvar Aalto (1898–1976), the third-most-famous Finnish architect, it opened in 1971, with additional facilities opening in 1975 and 2011. For some reason, most building names that in Finnish are “X talo” and Swedish “X huset” (both = English “X House”) are translated instead as “X Hall”. Helsinki is building a new Central Public Library on this site on Töölönlahdenkatu just north of Sanomatalo. Another reminder of how significant English is becoming, even to official Helsinki. A view of the library construction site from the south side, looking north. Another office building sits across Töölönlahdenkatu from the site of the new public library. A commuter train waits at Central Station in the background. 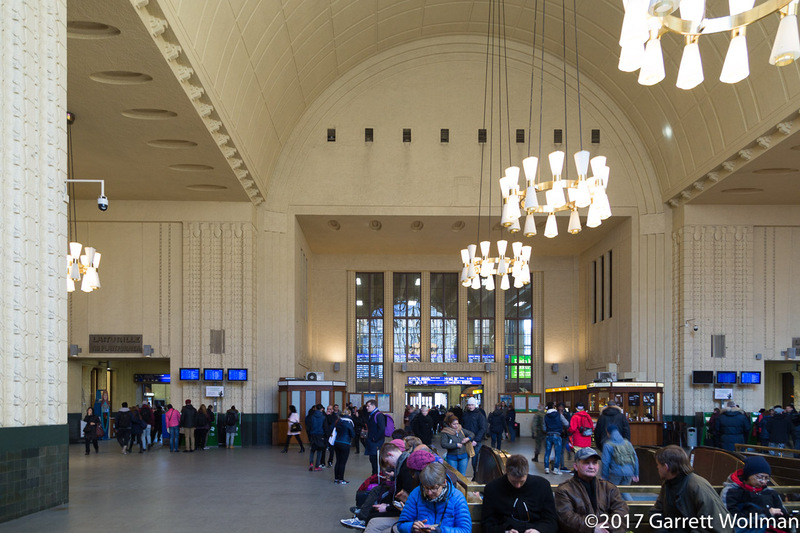 At the head of the platforms at Helsinki Central Railway Station is a fast-food place called Aseman Wursti, “Station’s Wurst”. They were advertising something called a “street dog” and I had to try one. 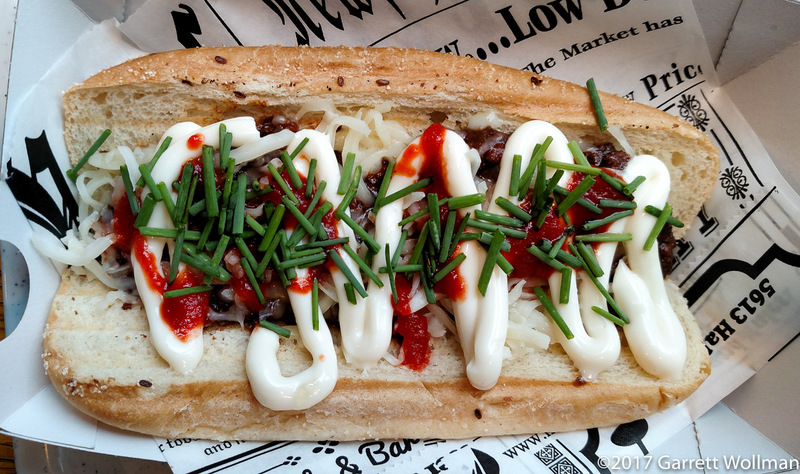 It was the first food establishment on my entire trip where there wasn’t enough English for me to figure out what was what, and I was a bit surprised to find out that a “street dog” had no sausage in it. This one had chili, though, and there was another one with pulled pork. 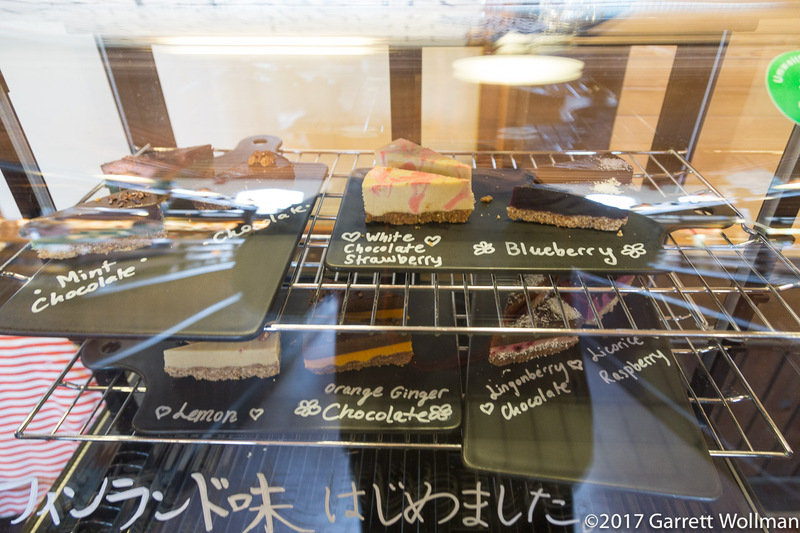 A market stall called “Tokyo Street” offers these, um, “cakes” in Hietalahti Market Hall — or rather, they would if they were open. A sign on the wooden shutters — in English — informs us that they are closed today for a private event. 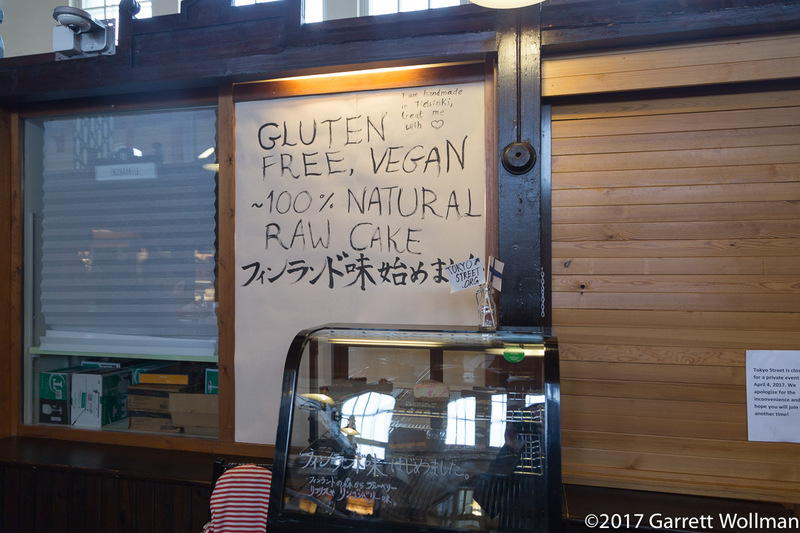 I put “cake” in quotation marks, but these are at least as much “cake” as a cheesecake is — I’m guessing, since they’re labeled as vegan, that they’re made mostly from tofu or some other soy product. And note again: all the signage is in English, except for the few bits of Japanese — no Finnish to be found. One last media stop, Saaristo Radio is a local commercial FM station. I have no idea what their programming is, but since they were literally around the corner from my hotel, I had to take a picture of the studios anyway. 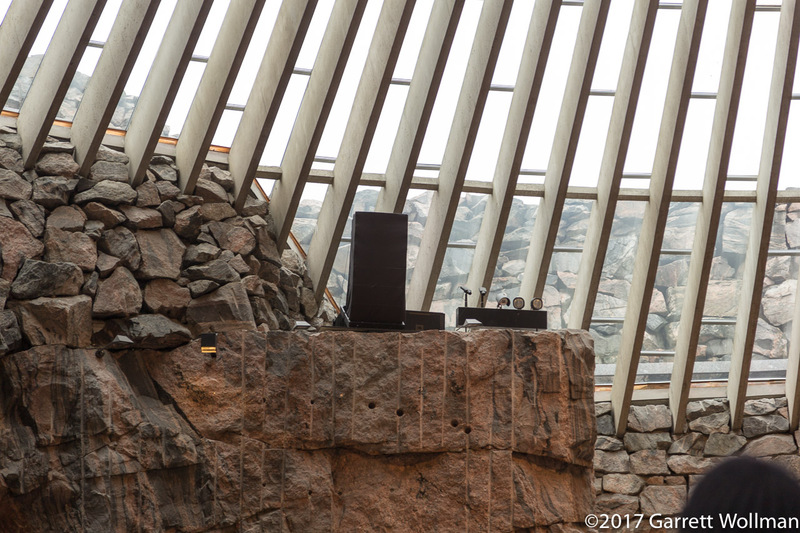 Gallery | This entry was posted in travel and tagged architecture, Helsinki. Bookmark the permalink.